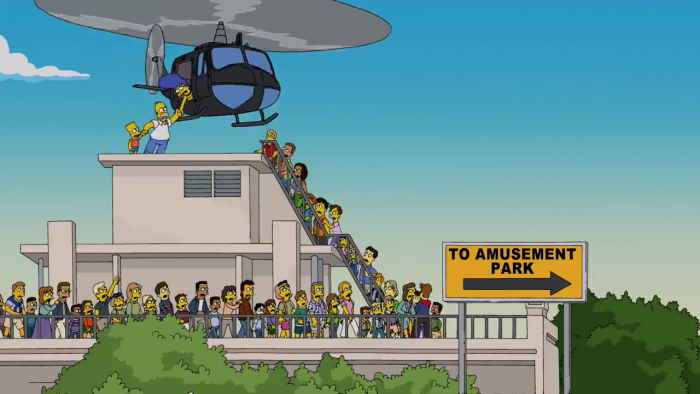 This week’s SATURDAY SIX takes a look at 6 Times THE SIMPSONS Totally Nailed Being A Theme Park Fan. We here at SATURDAY SIX HQ have never hid the fact of how much we love The Simpsons television show. 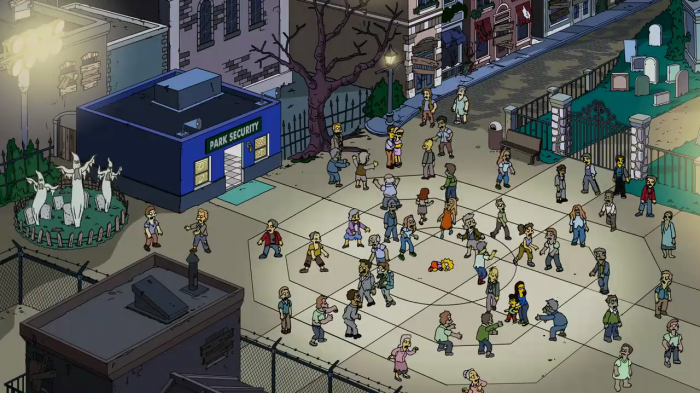 Despite it being a cartoon, for us it is right up there with the all-time great comedies including Seinfeld, Parks and Rec, and Cheers. 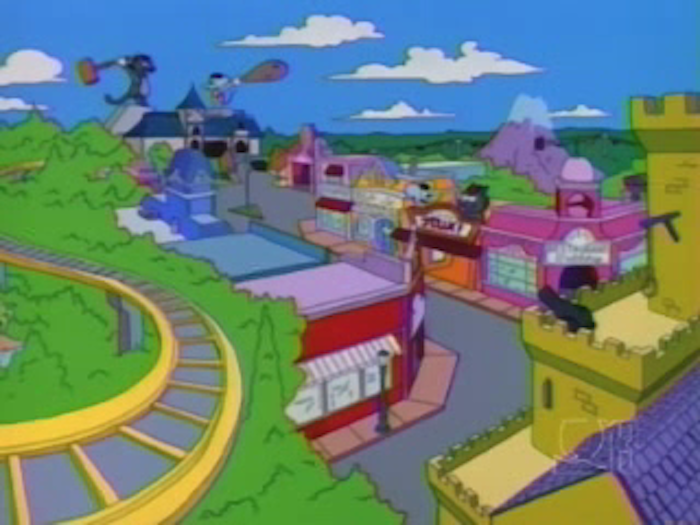 When Universal Studios Florida expanded the area surrounding The Simpsons Ride into a small version of Springfield, it was a dream come true. 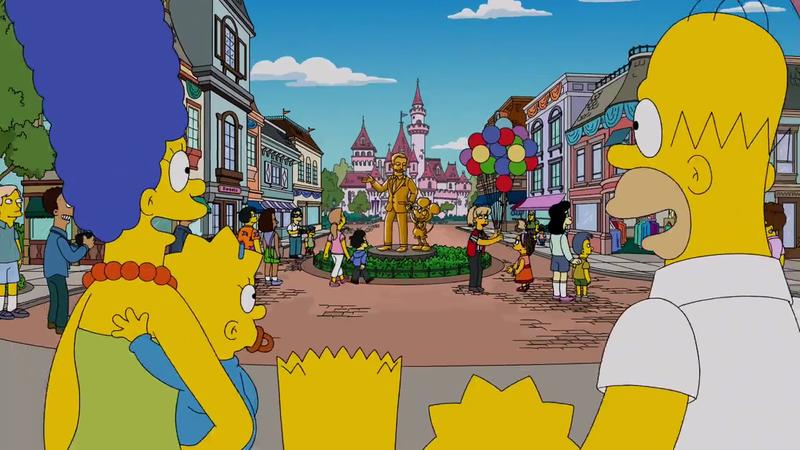 As a fan of The Simpsons dating back to when they were just short skits on The Tracey Ullman Show, seeing Duff Beer brought to life was just as a magical moment for me as it is for Potterheads walking into Diagon Alley and getting a Butterbeer. We’ll start off with an episode written by Judd Apatow, a man who knows a thing or two about comedy, with a resume that includes Freaks and Geeks, Knocked Up, and The 40 Year Old Virgin. 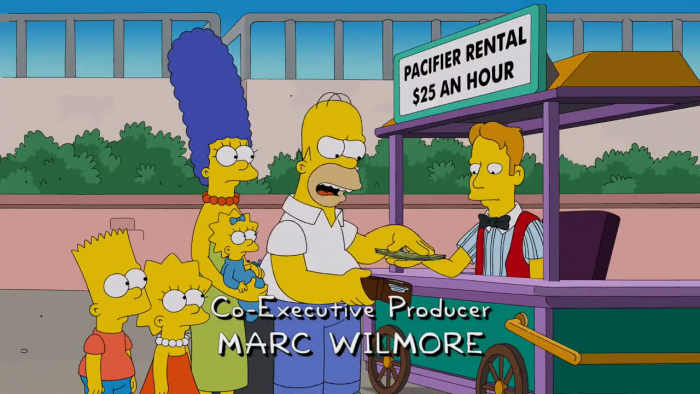 The episode centers around Homer Simpson being hypnotized into thinking he is a 10 year child. 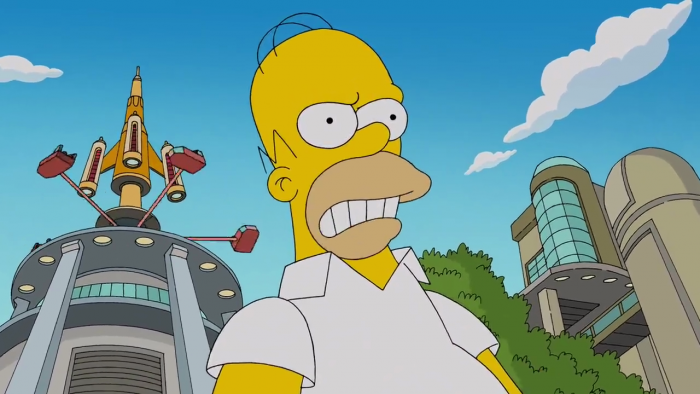 Bart Simpson then begins to take advantage of the situation, using Homer as a way to thwart bullies at school and be the “brother” he never had. 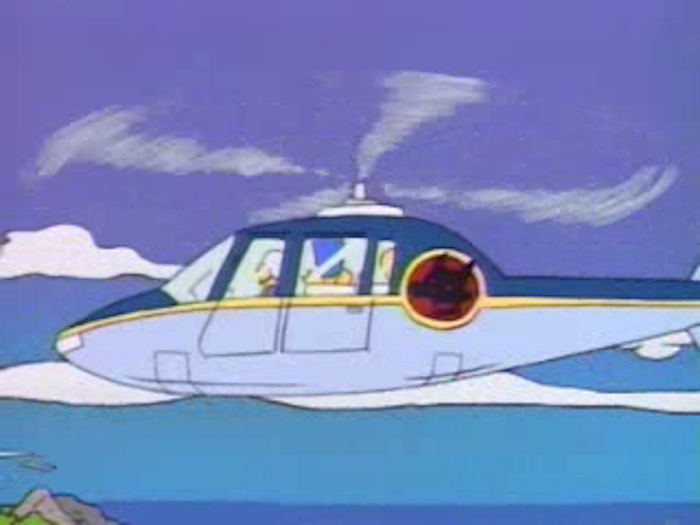 Before Homer can be de-hypnotized, Bart takes him to Itchy & Scratchy Land and we get to see them ride Soarin’ Over Springfield. 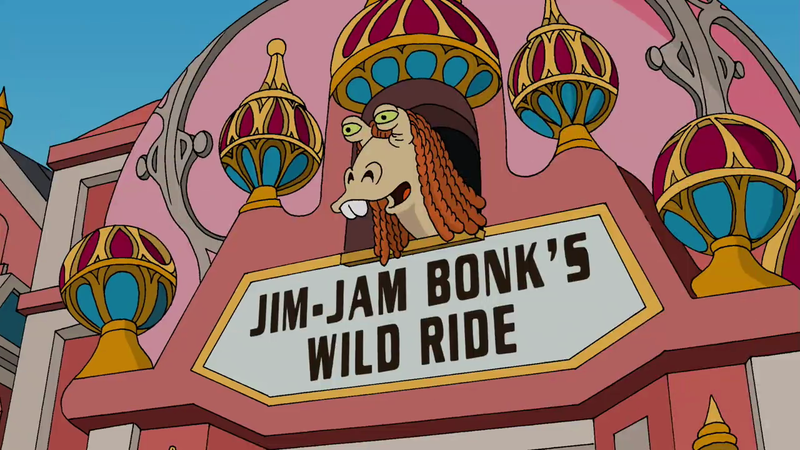 This was a five star parody of one of Disney’s most popular rides. Just like the real version, in Soarin’ Over Springfield you get to see guests’ legs dangling in front of you. 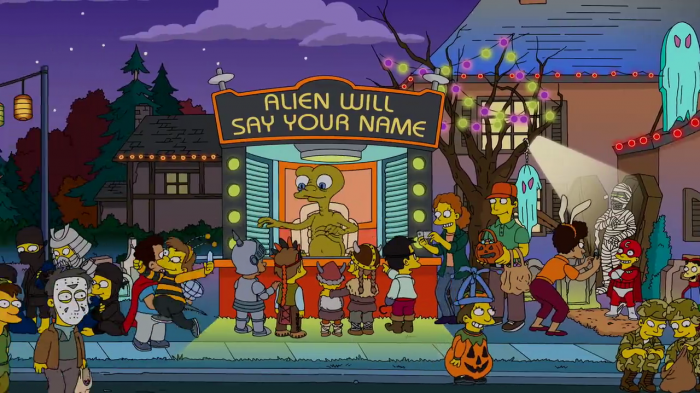 Note the reference to Mystery Science Theater 3000. 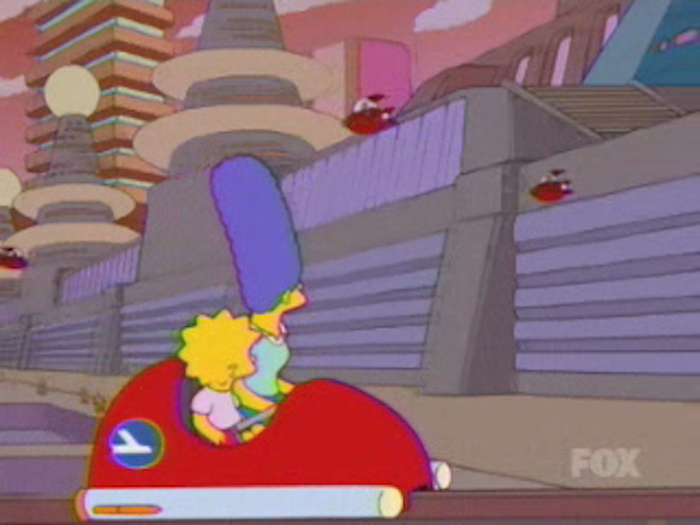 With a swelling score, Soarin’ Over Springfield flies by all the major landmarks in town, including the long running tire fire. 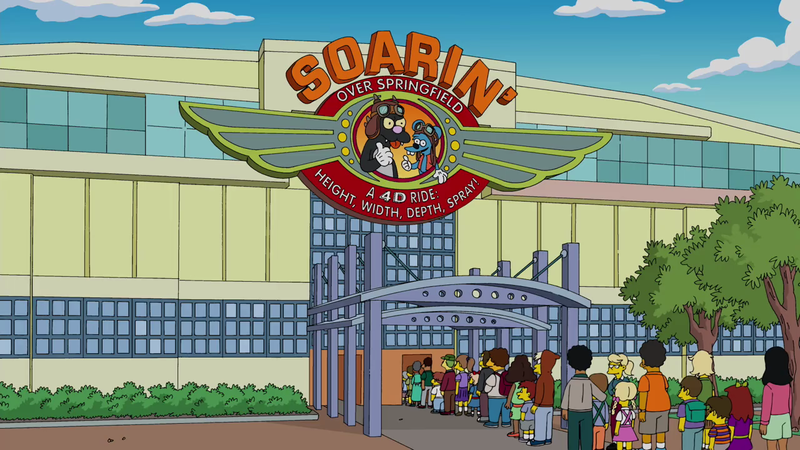 Burning tire smell blown into the faces of guests, just as the scent of oranges was sprayed in the original Soarin’ and fresh cut flowers in the new Soarin’ Around the World. 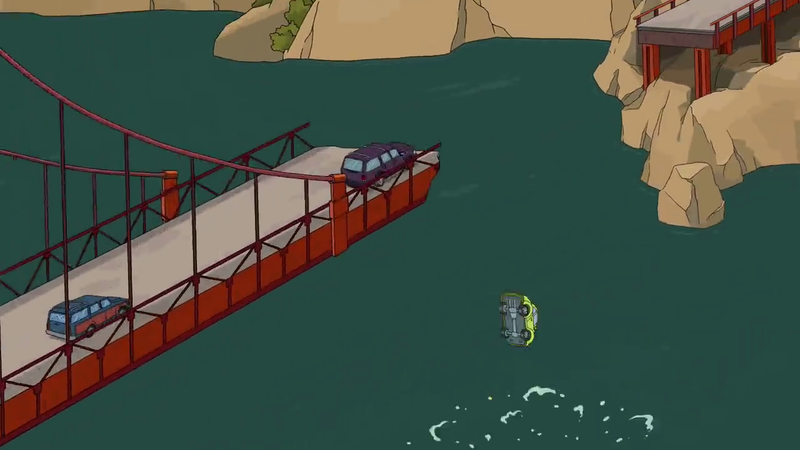 …cars falling off and into the water! 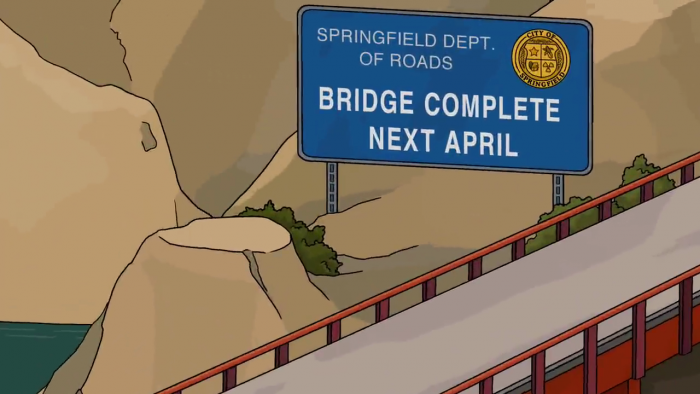 This hilarious sign was the transition to the next flyover scene. Whereas the old Soarin’ finished its “flight” at Disneyland, and the new version at WDW ends at EPCOT, Soarin’ Over Springfield finishes at Itchy & Scratchyland. 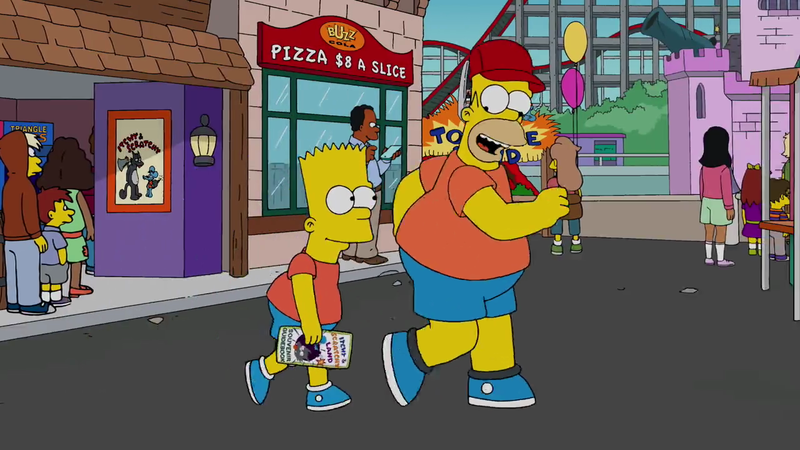 As Bart and Homer leave Soarin’ Over Springfield, we see them walk by a restaurant selling $8 slices of pizza. That one probably a little low, as the BoardWalk Pizza Window – the official pizza of Hell – is serving slices of cheese for not much less. 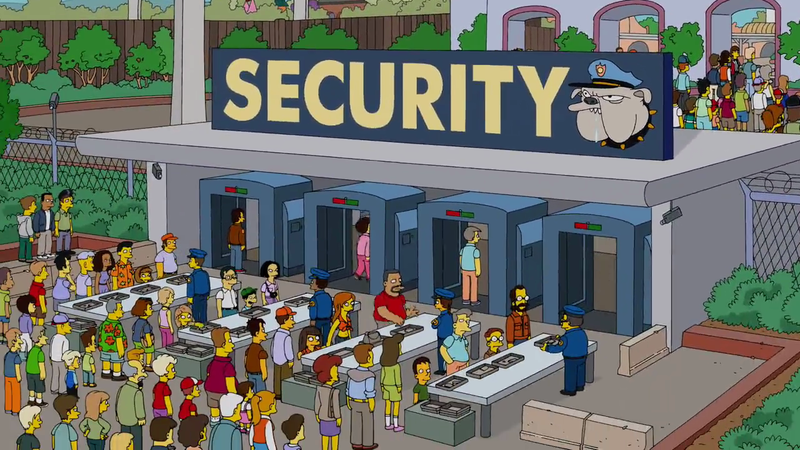 “Spoken like a kid who has never lived in a non fast pass world.” – Chief Wiggum with a true pearl of wisdom. 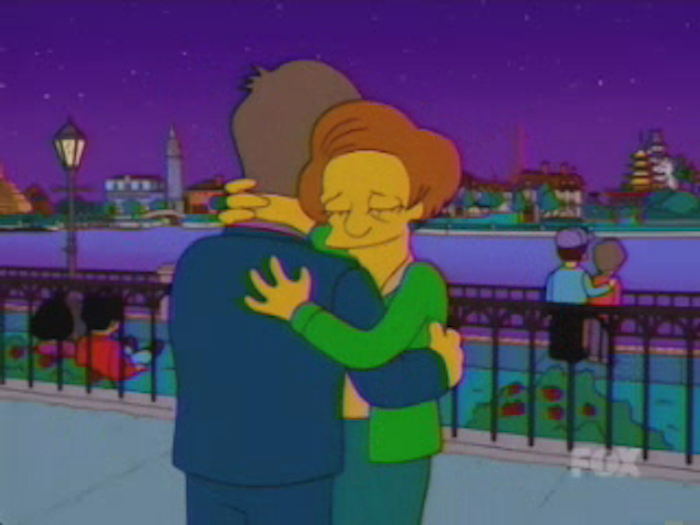 In Season 14’s “Special Edna,” Bart feels bad for his teacher Edna Krabappel and attempts to cheer her up with a nomination for the Teacher of the Year Awards. 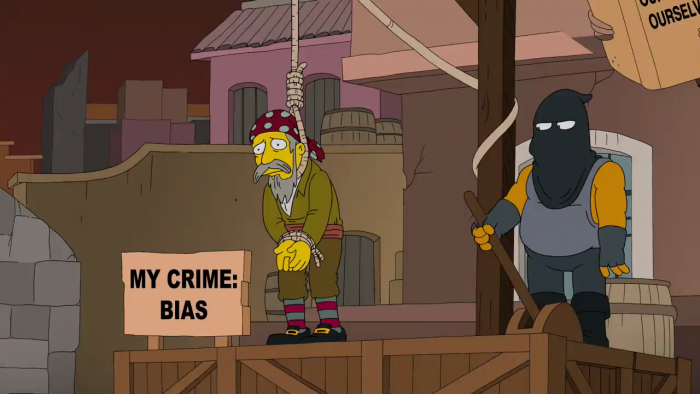 In a fun moment, the nomination committee can’t believe it is the “real” Bart Simpson nominating Krabappel, as he was always seen as an urban myth in the teaching world, something too horrible to actually exist. 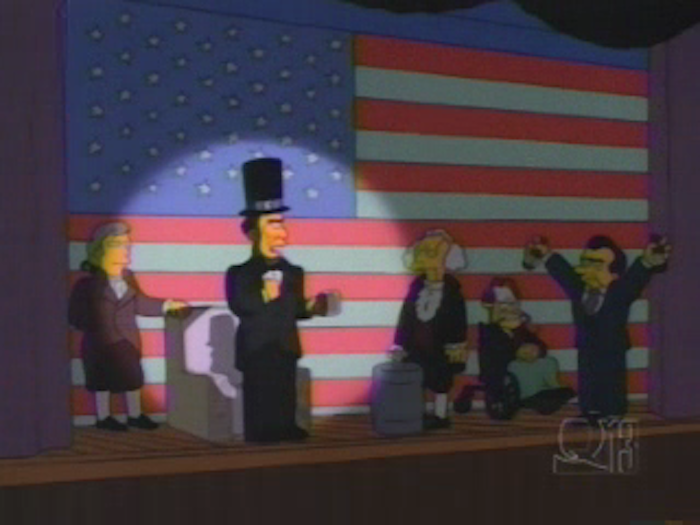 The award ceremony takes place in Orlando, Florida. 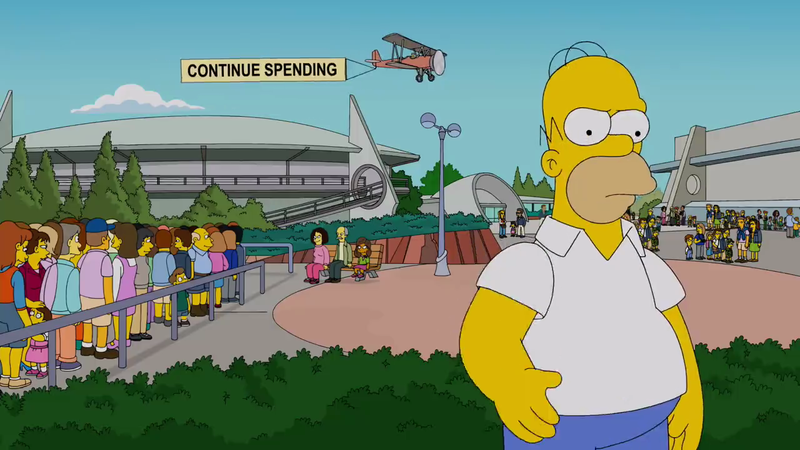 Everyone is excited until they learn it is being held at “EFCOT CENTER,” a place that Homer says is “even boring to fly over it.” The latter half of the episode has the characters experiencing several of the pavilions, have a meal in World Showcase, and end the night with a showing of IllumiNations. 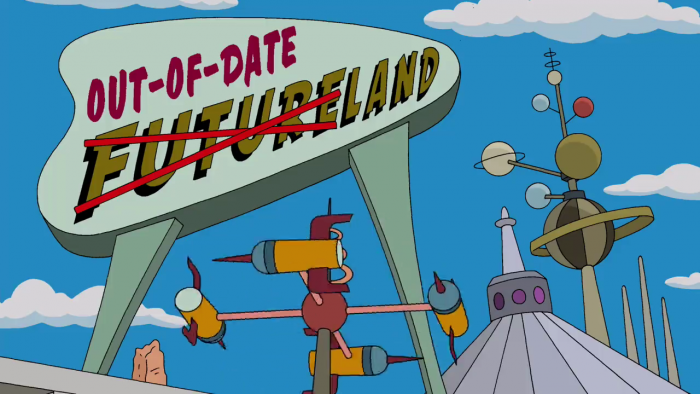 EFCOT Center: I assume that stands for Experimental Frozen Community Of Tomorrow? 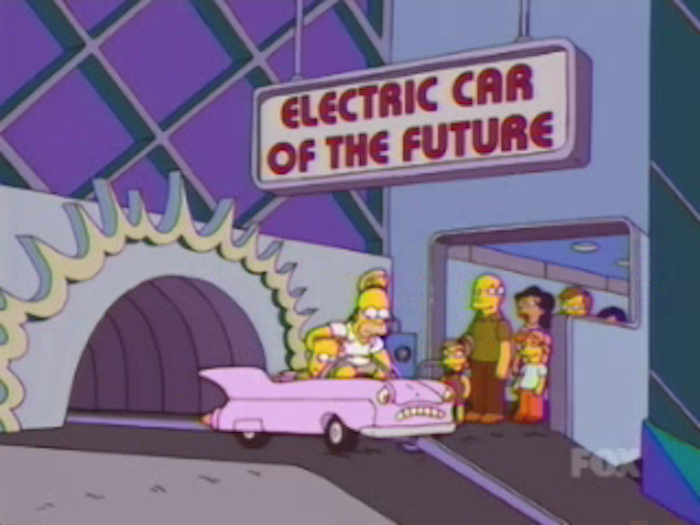 Boy, talk about being ahead of the curve! 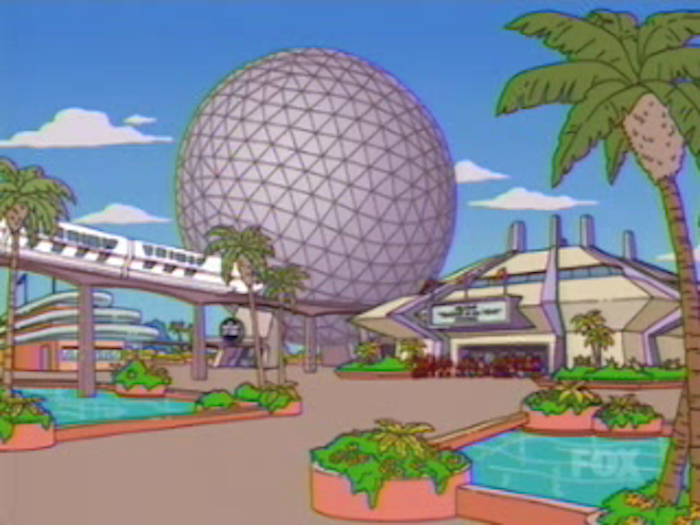 An attraction that looks like the fabled Horizons on the right, while Spaceship Earth is known as The Future Sphere. Eastern Airlines presents, the world of tomorrow! 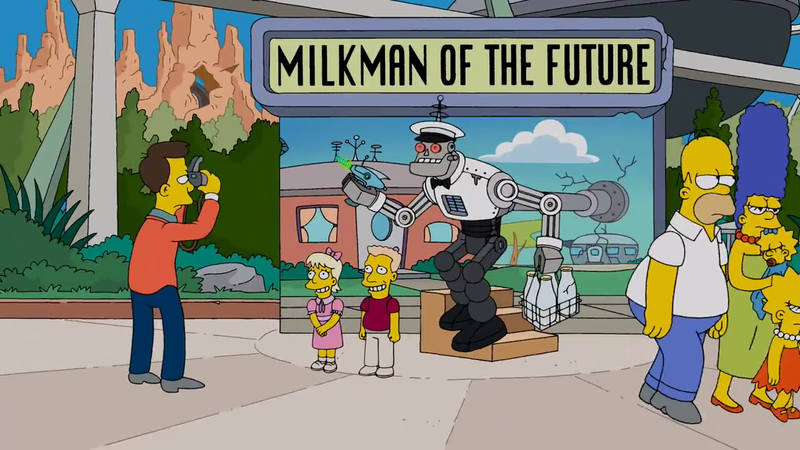 The attraction ended with Eastern Airline robots enslaving humanity. 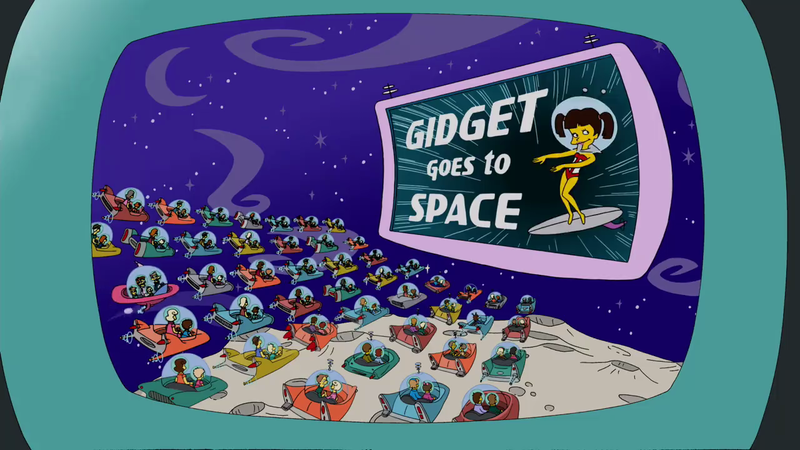 Referencing the former Honey, I Shrunk the Audience attraction. 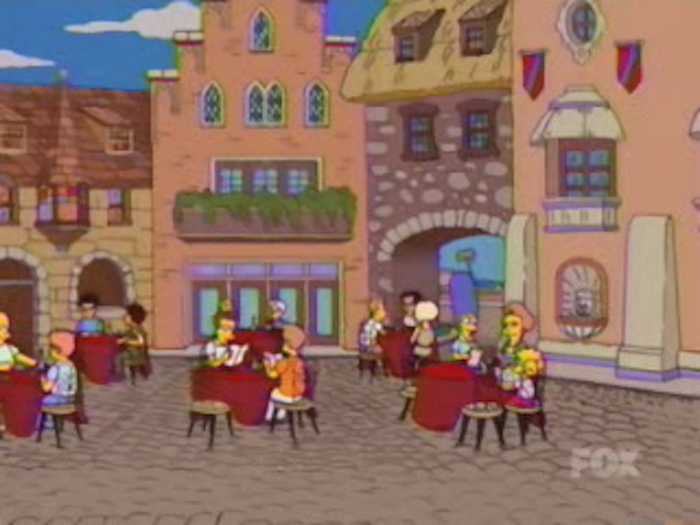 The Simpsons and Edna Krabappel eating in World Showcase. 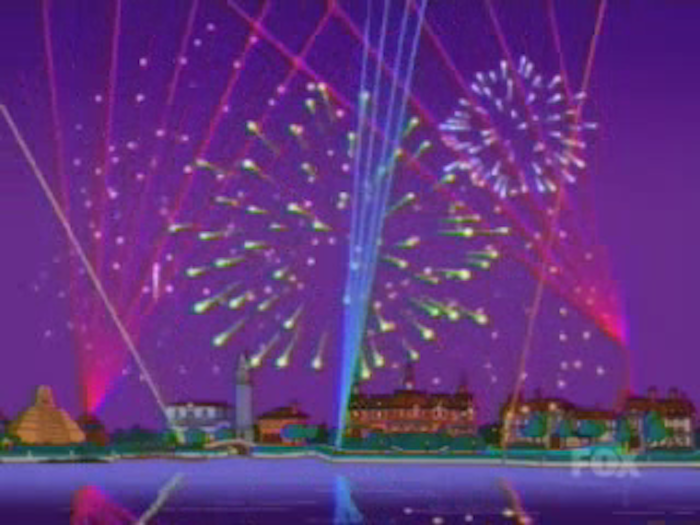 IllumiNations. 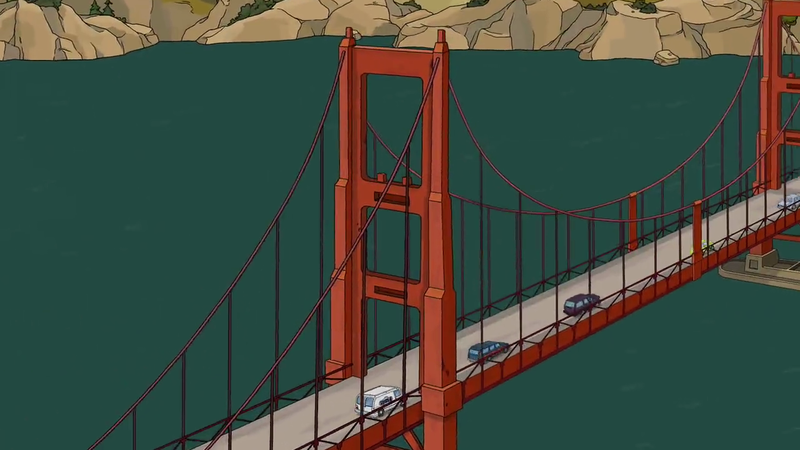 Hard to believe there is an animated version of the iconic Mexico temple. 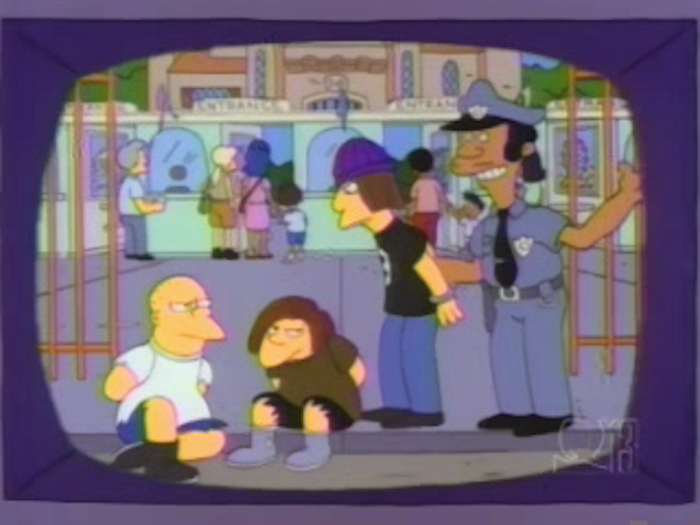 The very same temple that an IDIOT tried to climb last year. 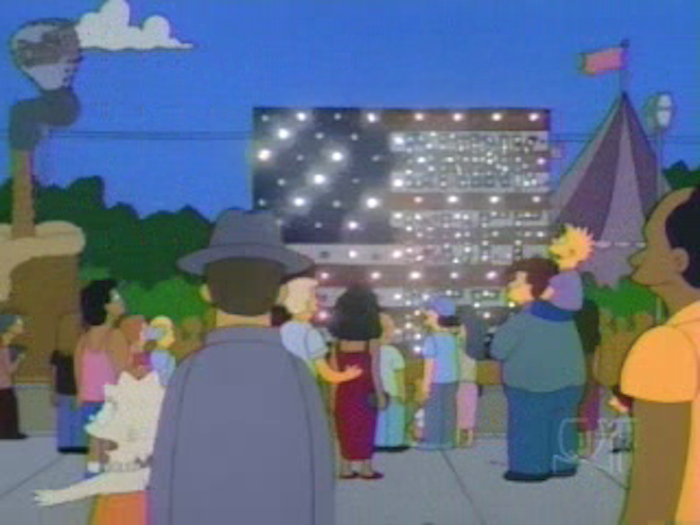 I see the Japan Pavilion! 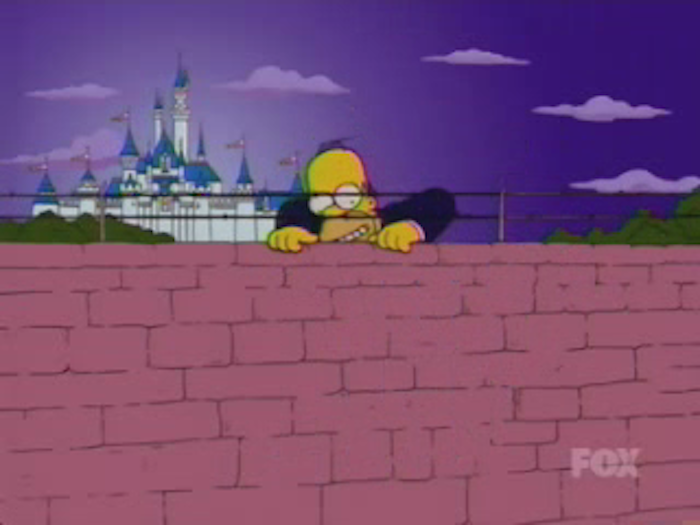 Once Homer scales the wall he asks for “one churro.” He is told, “that will be $14.” Homer screams, but then accepts. 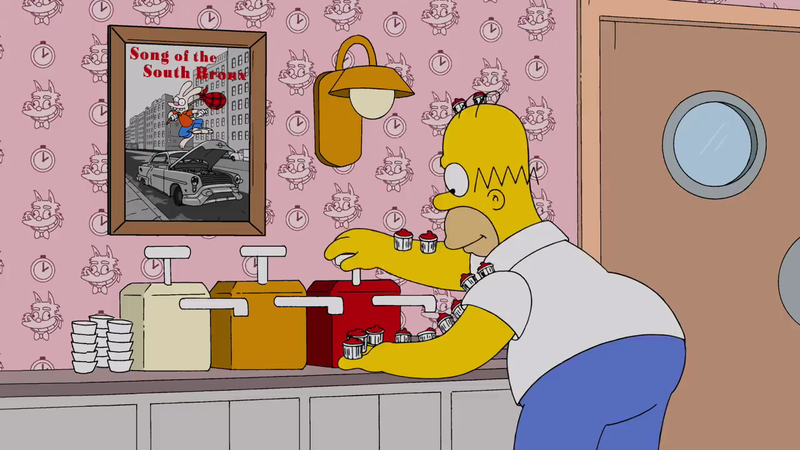 There’s a little Homer in all of us, isn’t there? Someone has certainly been to Universal’s Halloween Horror Nights, because Season 27’s “Halloween of Horror” made some spot-on observations. The Simpsons show has an annual Halloween episode titled “Treehouse of Terror,” but this was a second episode that season dedicated to the holiday. 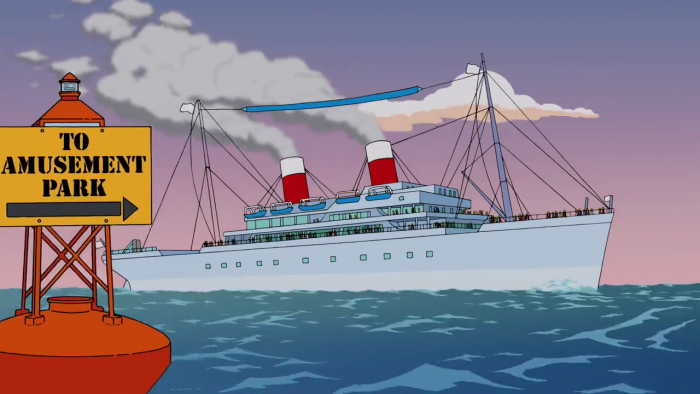 The show even referenced that fact within this episode. Truly meta. 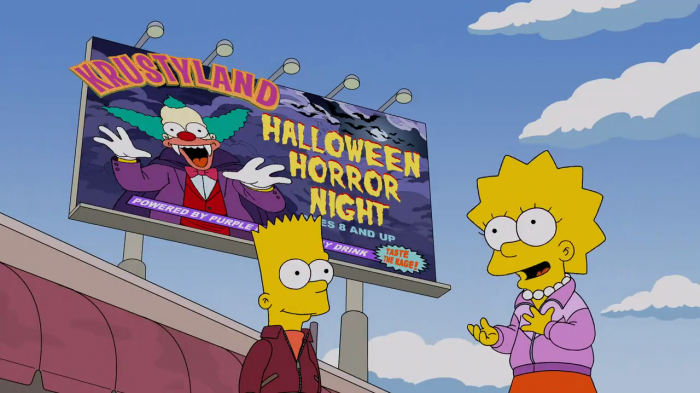 For this episode we have 8 year old Lisa Simpson excited that she is finally old enough to visit Krustyland’s Halloween Horror Night. She starts off the night excited, but immediately realizes the event is way too scary for her. 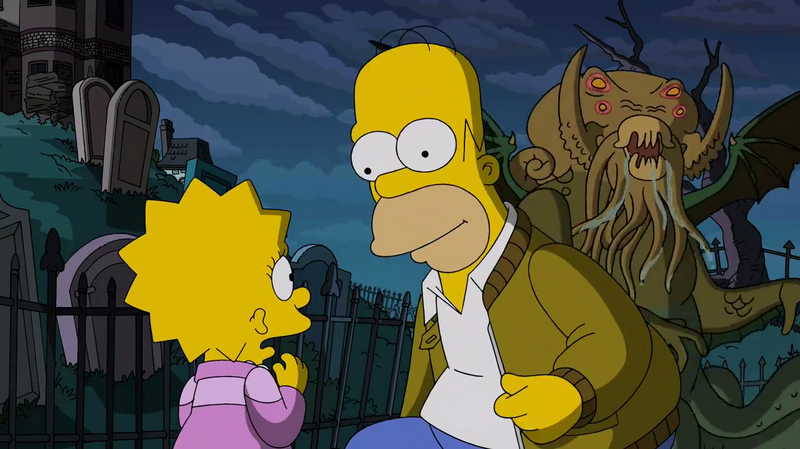 In a hilarious moment, Homer acknowledges that his daughter is scared, but reminds her how much the tickets cost. 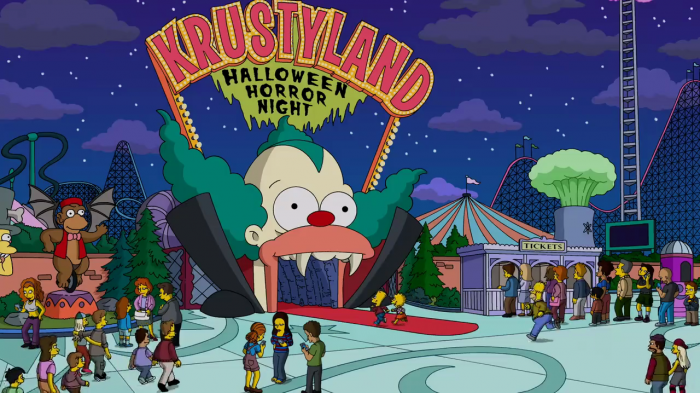 I’ve had several moments at the real HHN at Universal seeing young children absolutely terrified walking through the haunted houses. 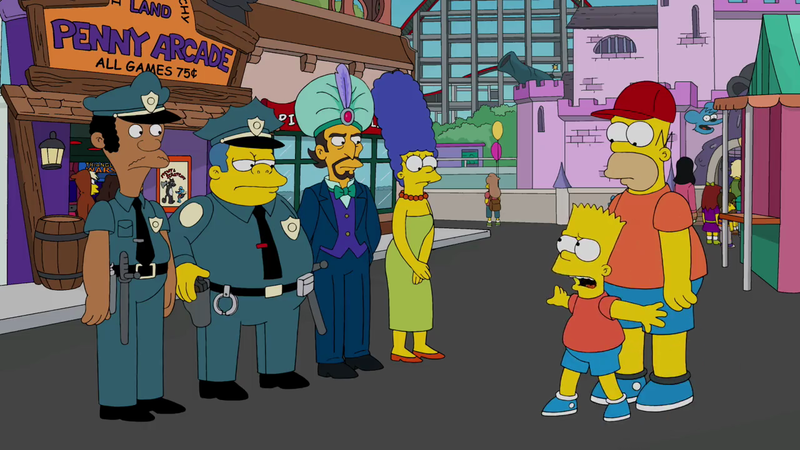 Universal has plenty of cops waiting outside each house in case anyone gets “punchy,” but maybe some Child Protective Service people should be there as well. 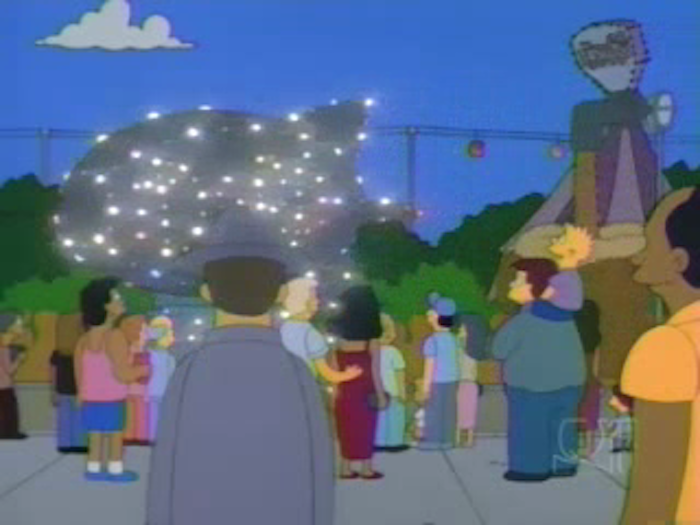 Anyway, the episode itself was a pitch-perfect send up of Universal’s annual hard ticket event. 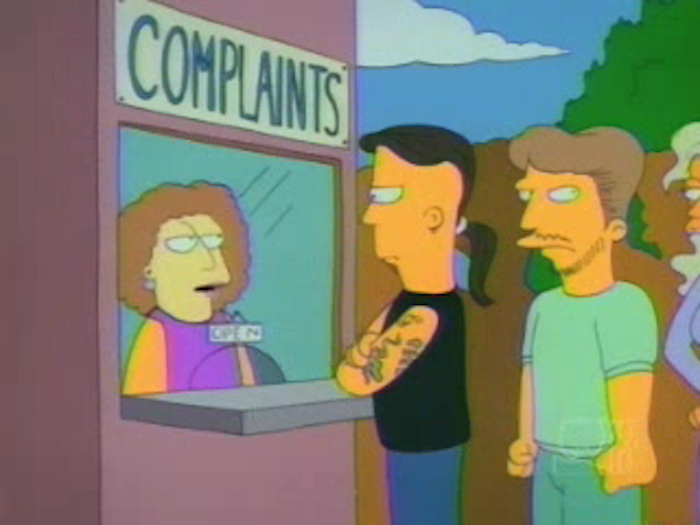 “Yeah, they do it right. 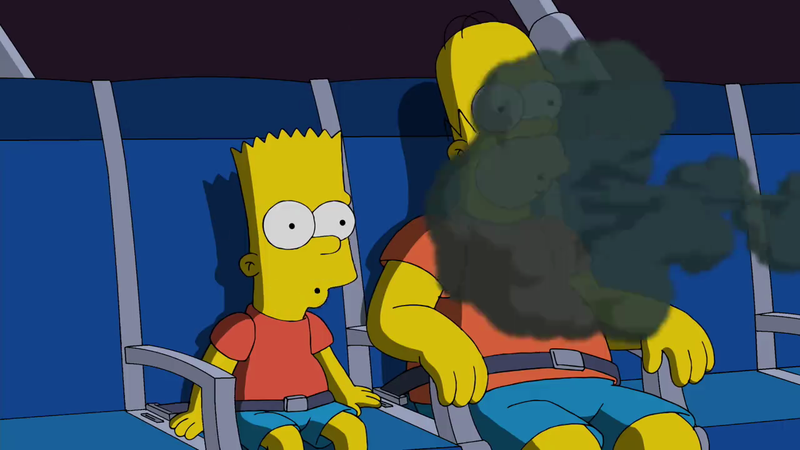 Wait till you try the black cotton candy. It tastes just like cotton candy.” – Bart. 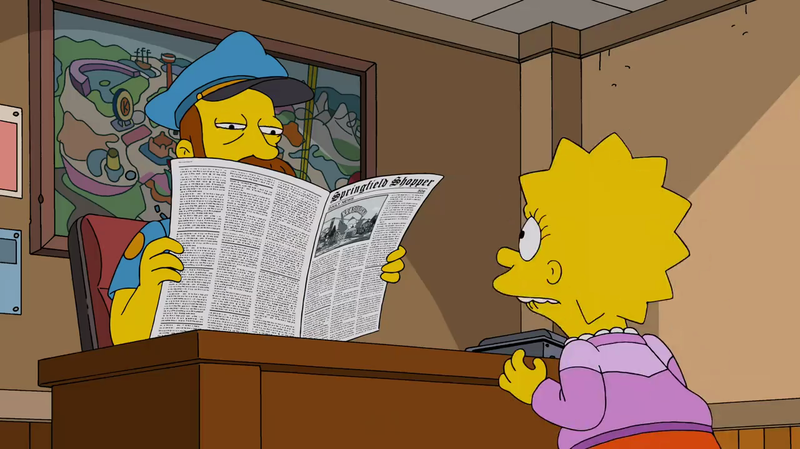 “That’s not scary. 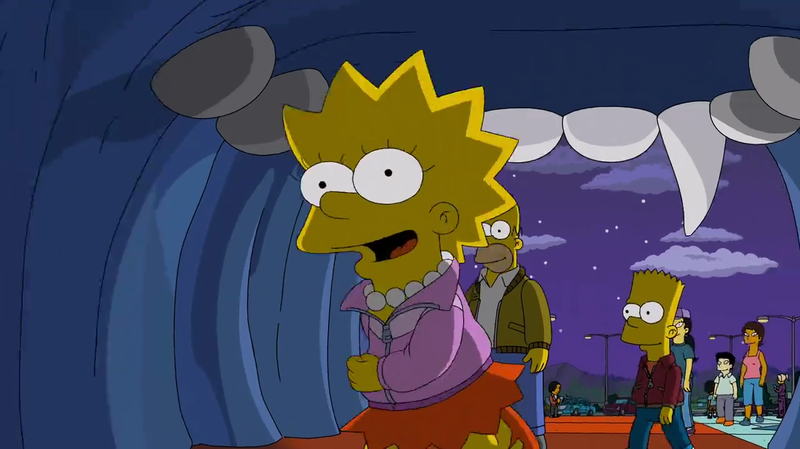 I thought this was gonna be scary!” – Lisa, running into Halloween Horror Night. 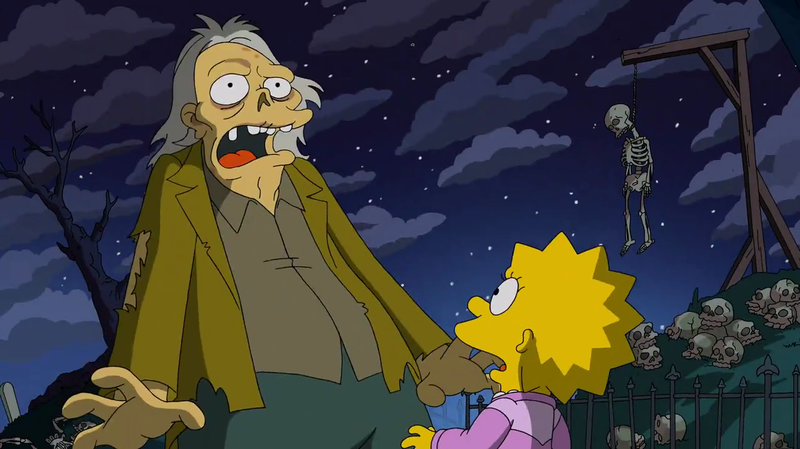 Lisa encounters her first scareactor. 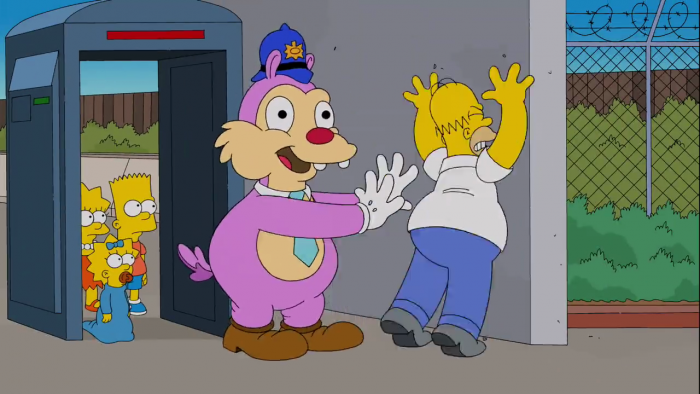 Who reveals a second costume. Krustyland’s Halloween Horror Night echoes Universal’s HHN with plenty of scareactors weilding chainsaws. You get a chainsaw! 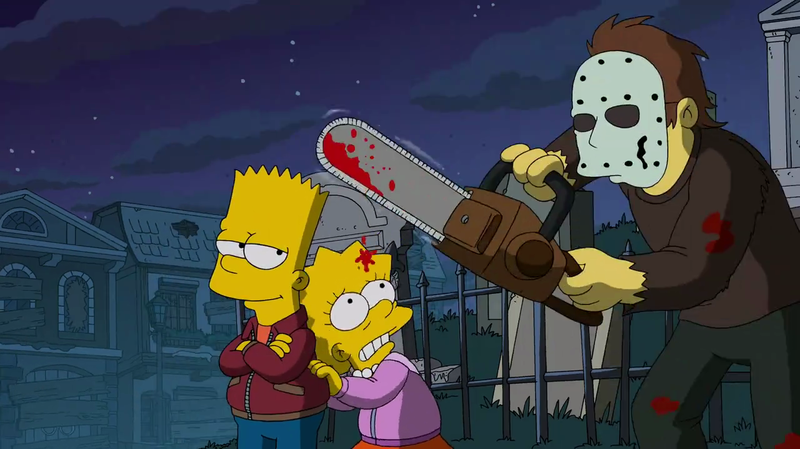 And YOU get a chainsaw! 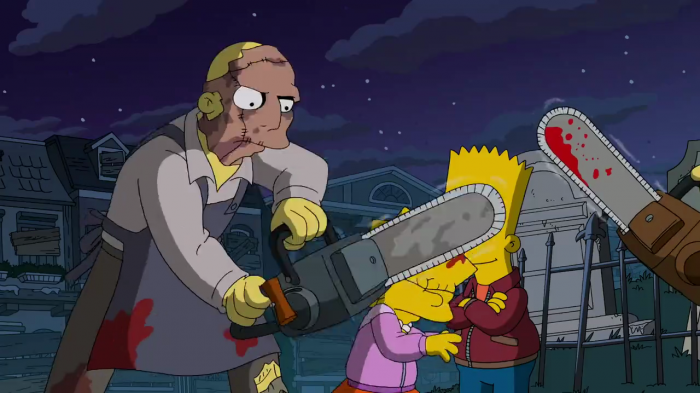 And YOU get a chainsaw…. 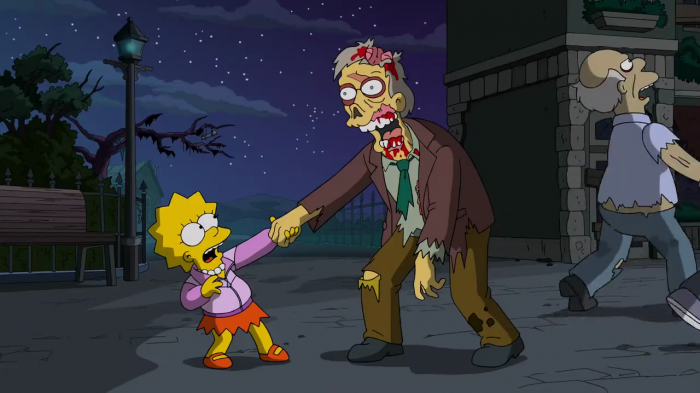 Homer offers to hold Lisa’s hand through the zombie horde. 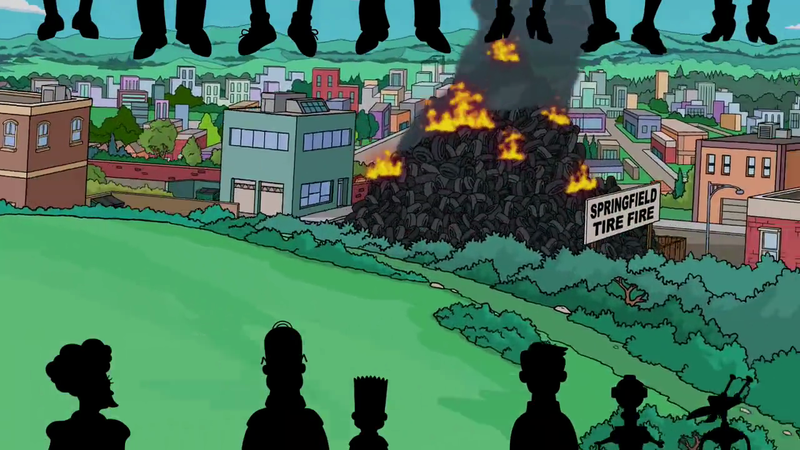 “This isn’t real. 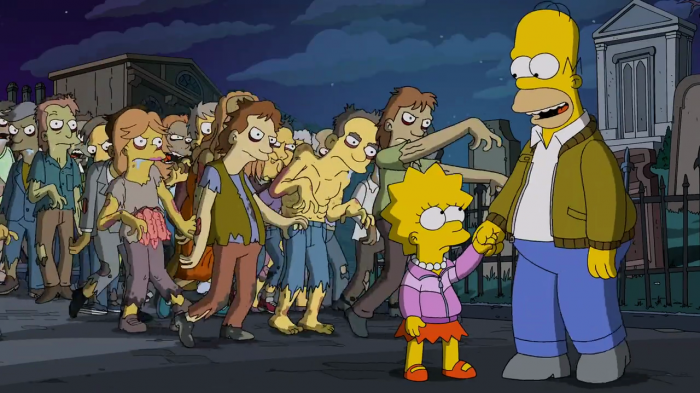 ‘This isn’t real.” – Lisa speaks to herself as she walks through the horde. Lisa then realizes she is holding a zombie’s hand! Which was revealed to be a scare zone. “Shut it down! Shut it Down. 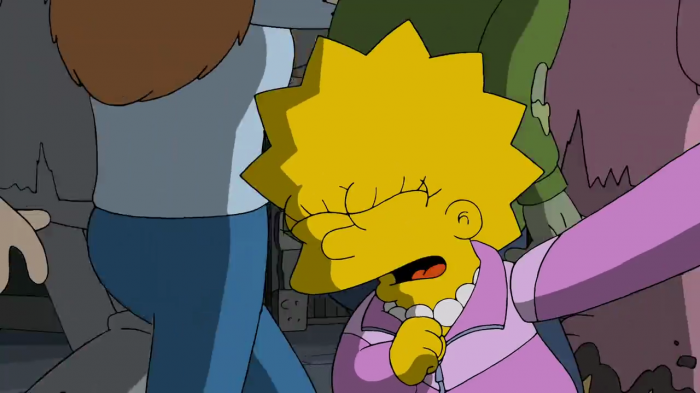 Shut the whole damn thing down!” – Operations manager after seeing Lisa balled up in the fetal position. 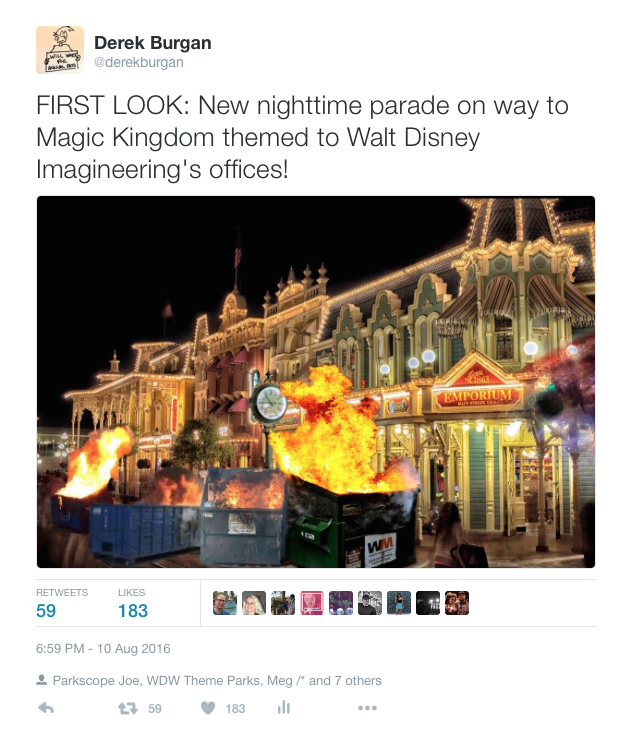 Theme park bloggers are not amused. 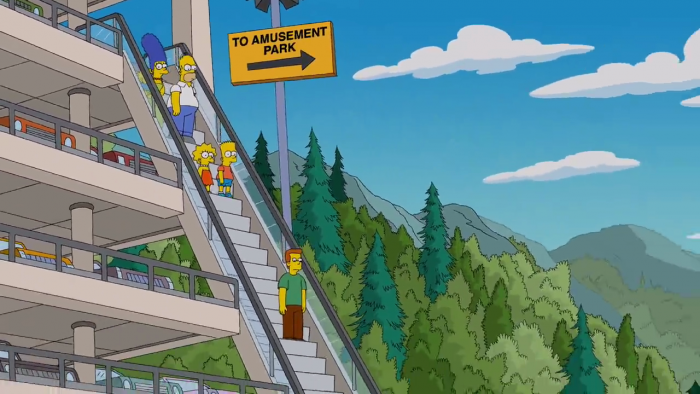 One of the earliest attempts at mocking the theme parks we know and love took place all the way back in Season 4 (airdate of the show was in January, 1993). 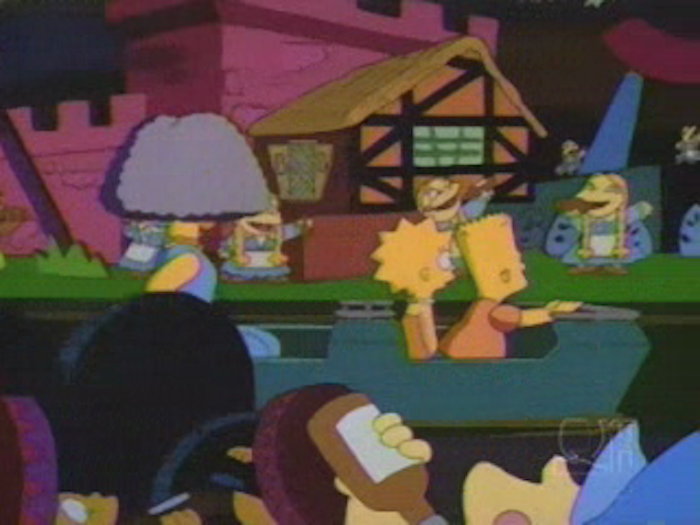 We started off the show with The Simpsons watching TV and seeing a commercial for Duff Gardens. 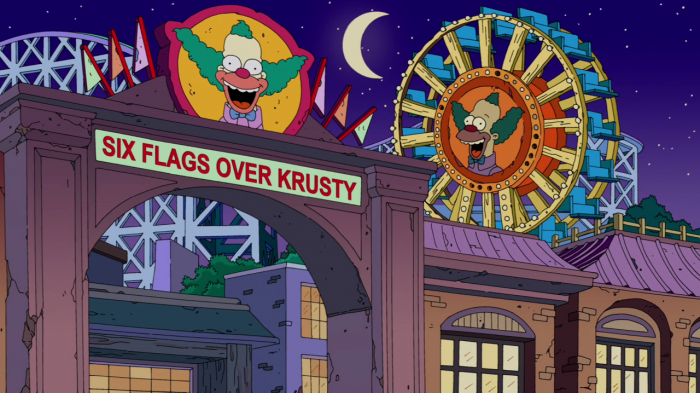 While Duff Gardens itself was more of a parody of Disney, the name is referencing Busch Gardens. For those who don’t know, Busch Gardens used to be run by the Anheuser-Busch company, the makers of Budweiser. In The Simpsons universe, Duff Beer is the clear equivalent of Budweiser. Homer is just as excited as Bart and Lisa when he saw the television and asked the kids, “What do we say when we get to the ticket booth?” The kids replied,”we’re under 6!” followed by Homer adding, “and I’m a college student!” Just amazing. 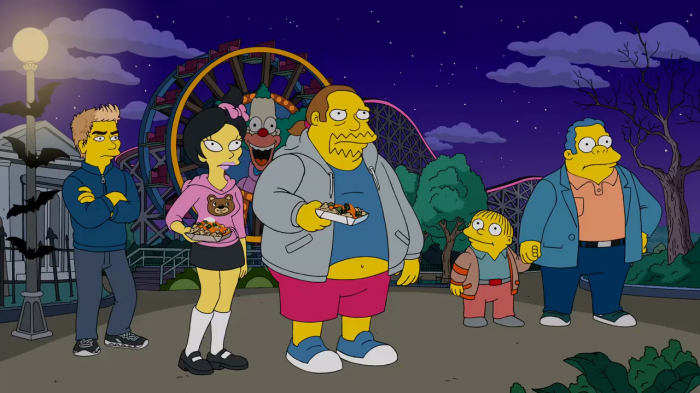 Homer ends up getting sick and the kids were taken to the park by their aunt Selma, who would have liked to be anywhere else. 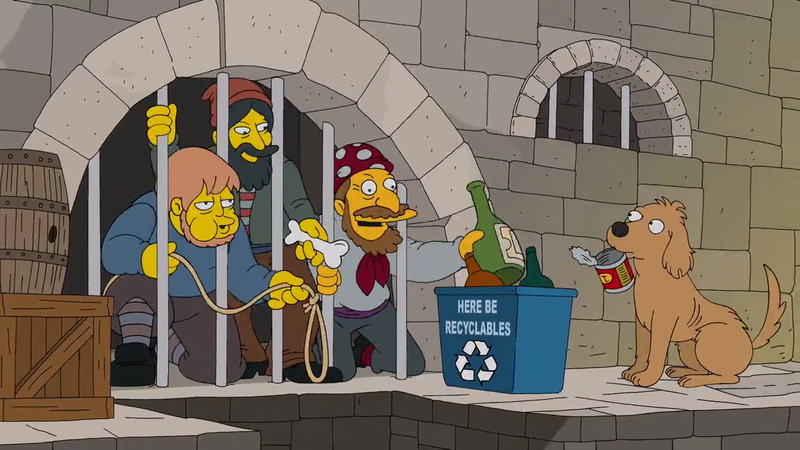 This episode marked the first appearance of the Seven Duffs, a clever spin on Disney’s Seven Dwarfs. 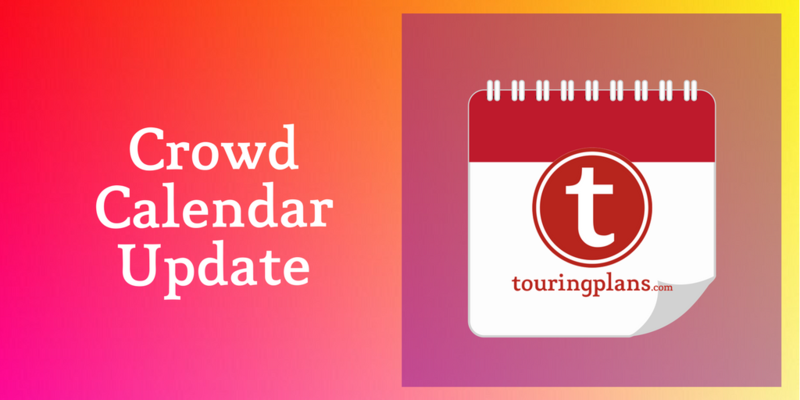 We also got to see some fun poked at it’s a small world, Hall of Presidents, the Main Street Electrical Parade, and even theme park gift shops. 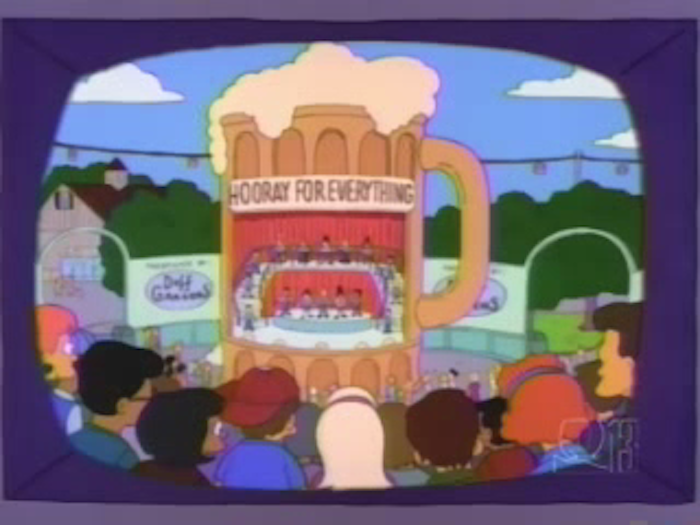 The Hooray For Everything gang. 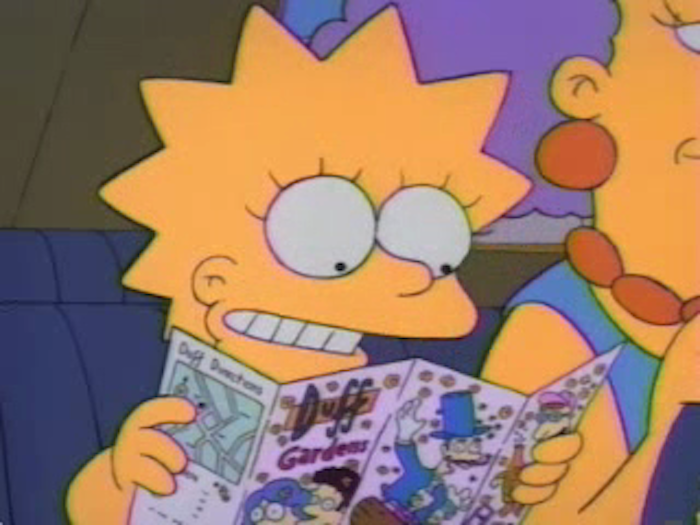 Lisa reads from a Duff Gardens pamphlet. The Seven Duffs make their first appearance. 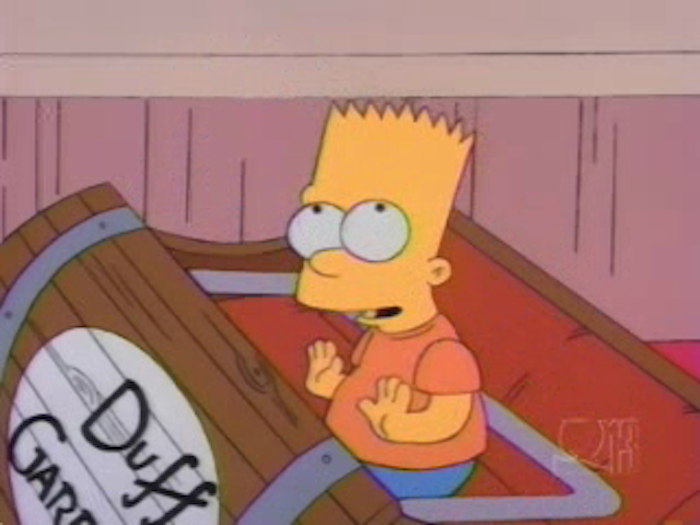 The Seven Duffs are Tipsy, Queasy, Surly, Sleazy, Edgy, Dizzy and Remorseful. 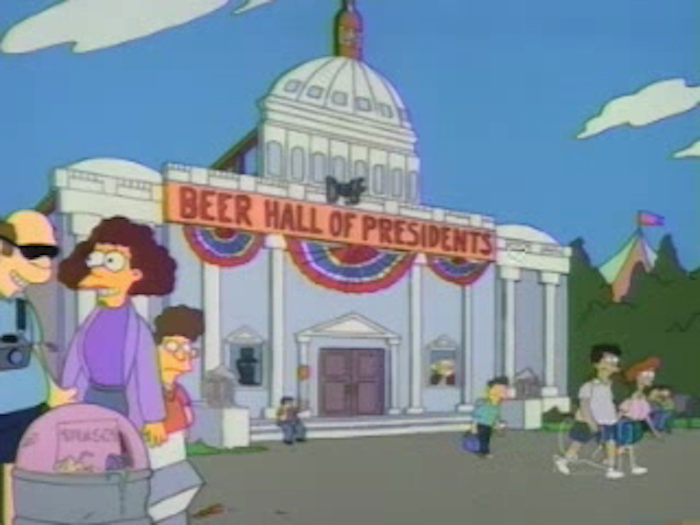 The Beer Hall of Presidents. “Four score and seven years ago we took the finest hops and barley to brew a full bodied lager.” – Abe Lincoln in the Beer Hall of Presidents. 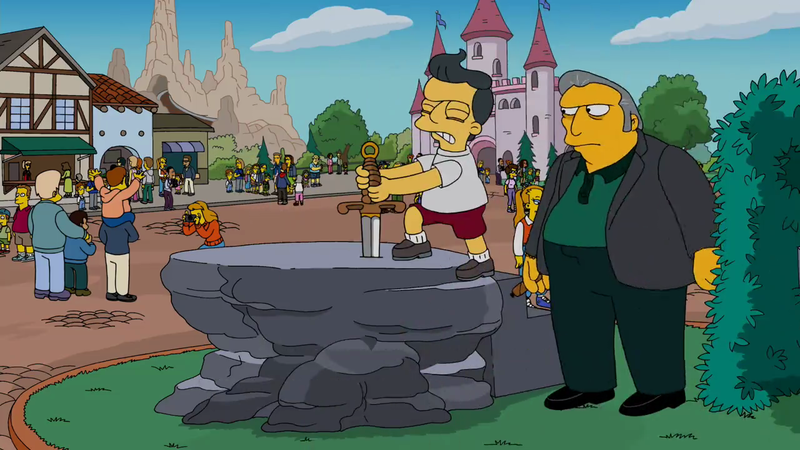 The Simpsons foreshadowing Disney’s Villains Unleashed event over 20 years earlier. 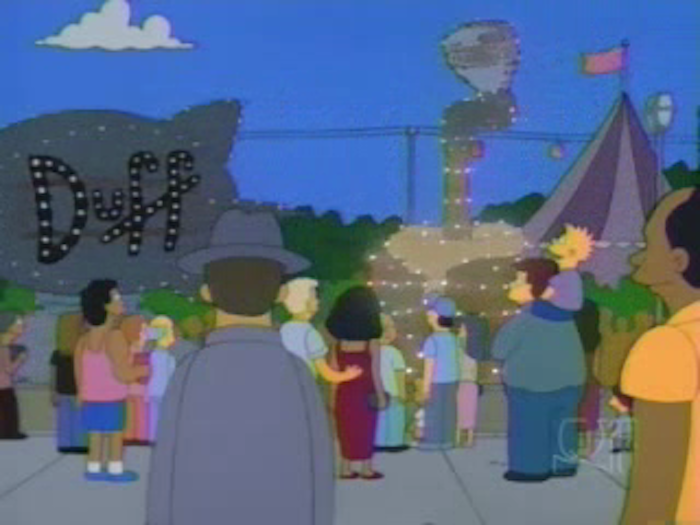 Duff Gardens it’s a small world equivalent. 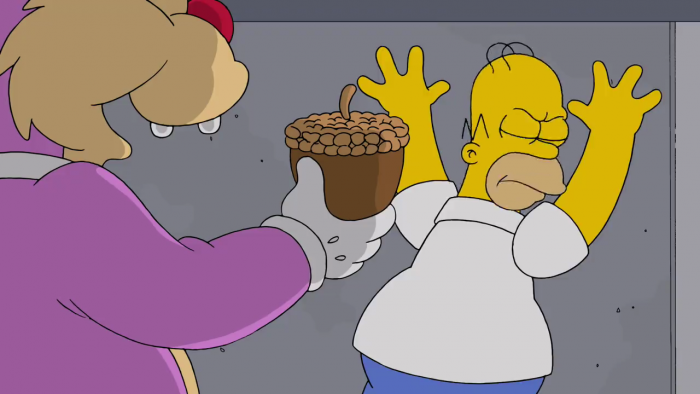 “Duff beer for me. 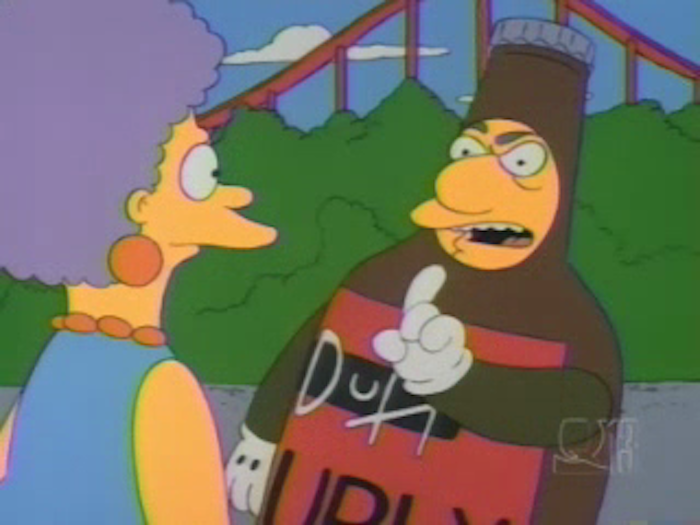 Duff beer for you. 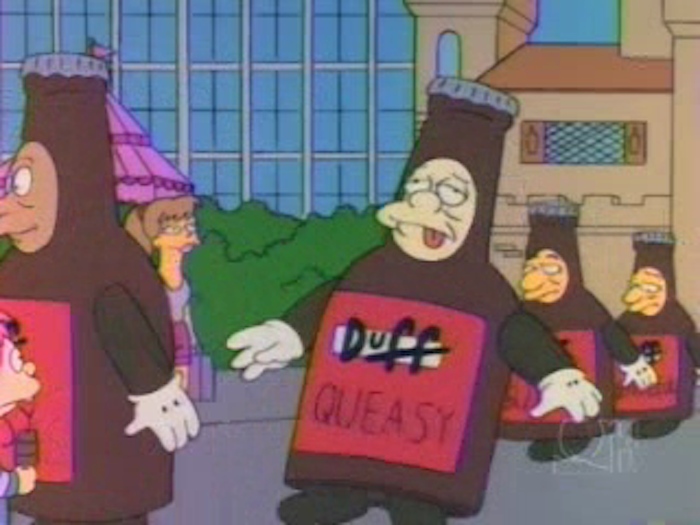 I’ll have a Duff, you have one too!” – Song playing throughout the ride. 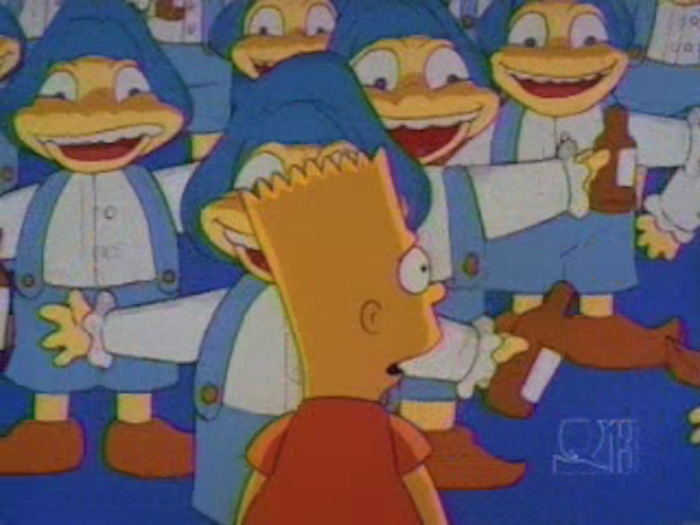 Bart stands on large lollipops to artificially increase his height. 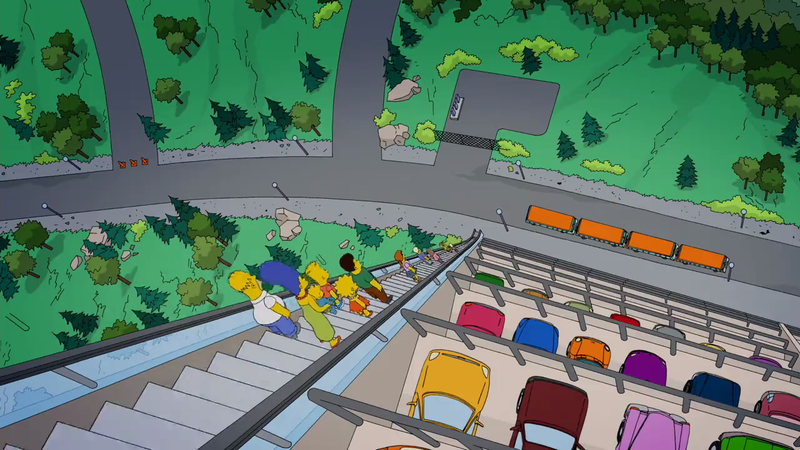 “Woah, that isn’t good.” – Bart, after the safety bar goes behind him. Bart would later find himself hanging upside down on the ride. 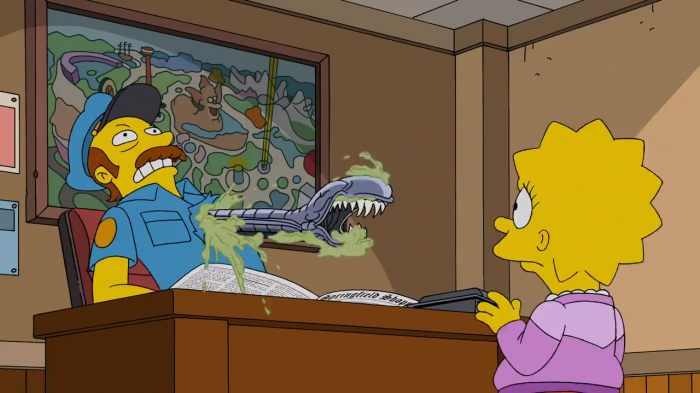 As we stated earlier, The Simpsons is an all time classic show, with many episodes ingrained into pop culture. Several episodes such as Marge vs. 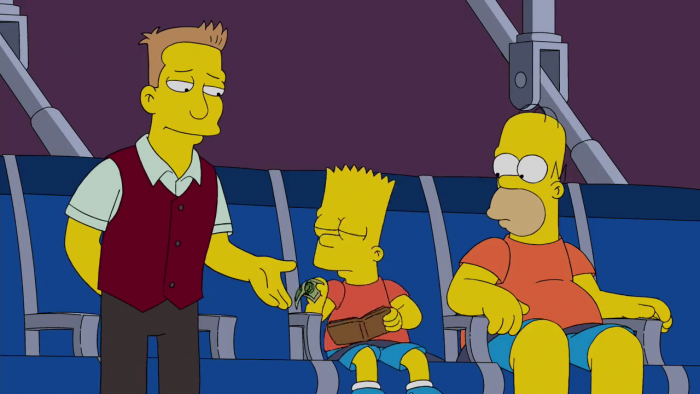 The Monorail, Cape Feare, and A Fish Called Selma can be put in a time capsule to show future generations how great TV can be. 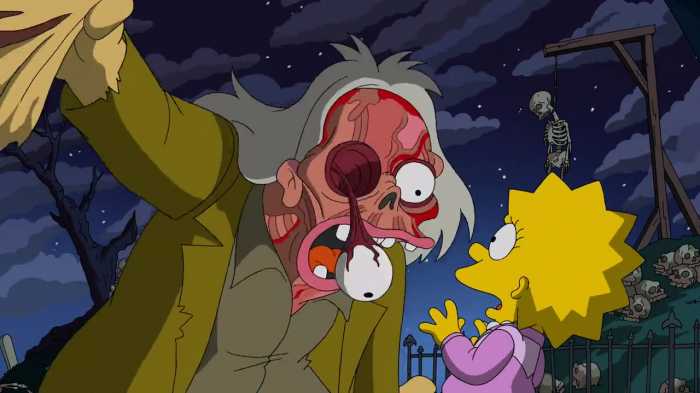 For my money, Season 6 is overall the greatest season in the history of The Simpsons, with Homie the Clown, And Maggie Makes Three, and the Who Shot Mr. Burns? 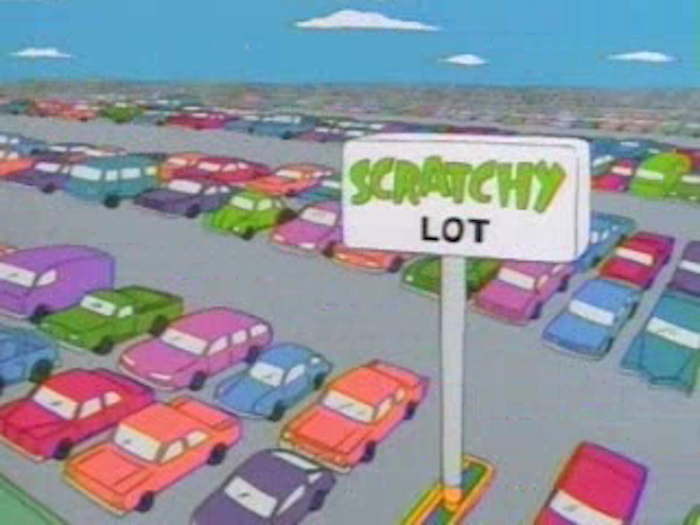 season ending cliffhanger being three monster home runs, but – for me – pound for pound the best episode was Itchy & Scratchy Land. 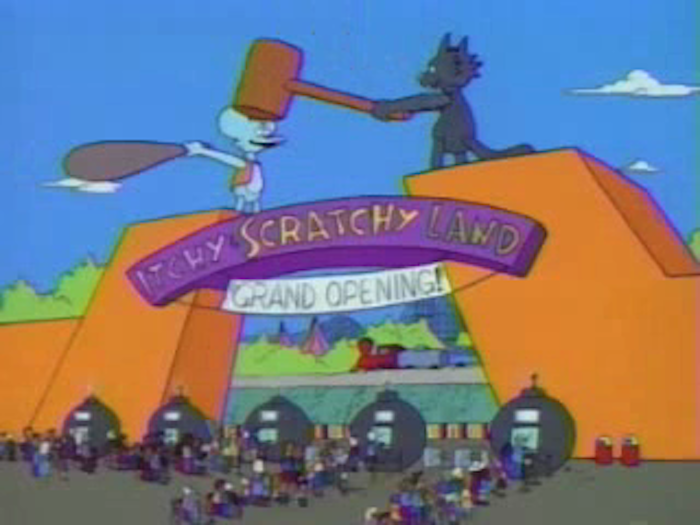 Similar to Duff Gardens, Bart and Lisa see a commercial for the new Itchy & Scratchy Land theme park and beg Marge and Homer to take them. 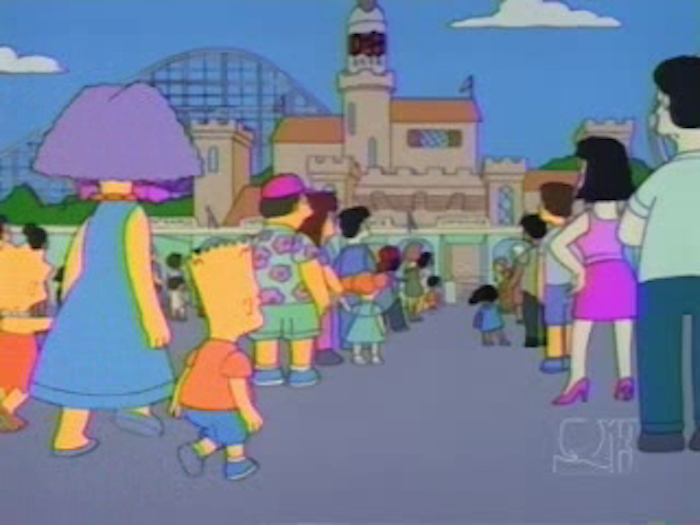 Marge had her heart set on visiting a bird sanctuary, but after finding out the area has Parent’s Island (referencing Disney’s old Pleasure Island) the family makes a group trip to the theme park. 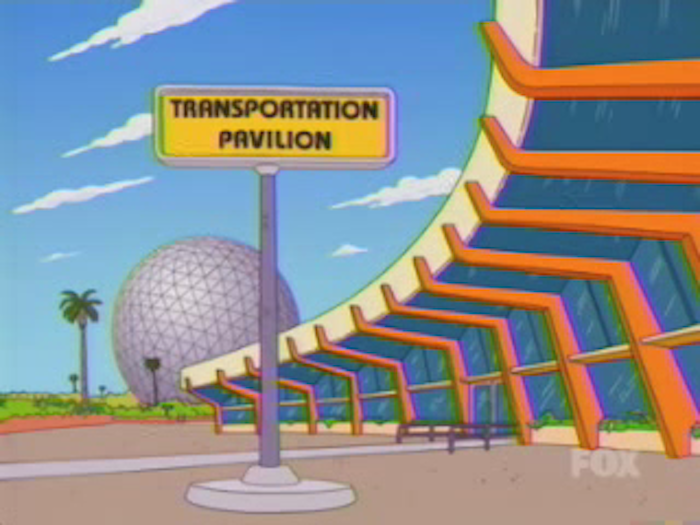 What follows is a tour de force in theme park related comedy. 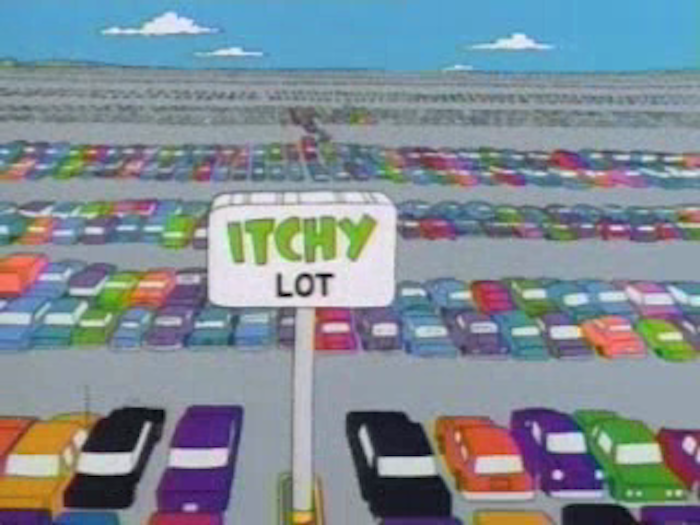 Anyone who has ever parked their car at a theme park will laugh. Anyone who has bought Disney Dollars will laugh. Anyone who has gone into a theme park gift shop will laugh. 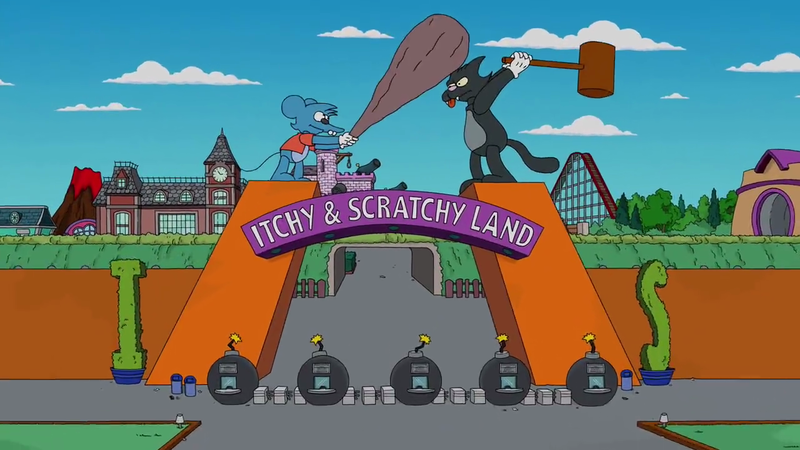 Besides being filled with amazingly accurate jabs at the Disney parks here in America, the show ends with a jaw dropping finish at Euro Itchy & Scratchy Land (which was making fun at the all too real problems Euro Disneyland faced at the time.) When I die, bury me with the VHS copy of this episode I taped when it aired on TV. 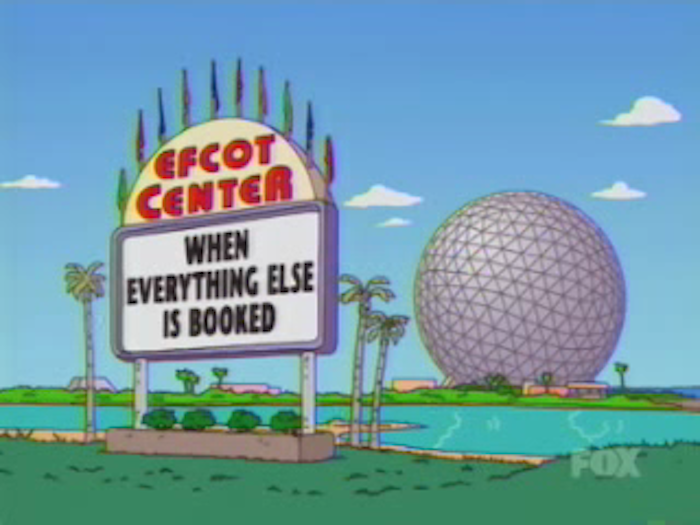 This reminds me of the Welcome to Walt Disney World sign we all drive by entering property. 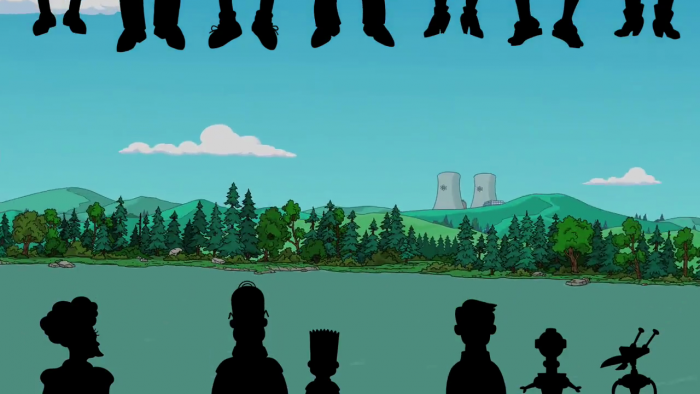 The show started off with a reference to Jurassic Park, but ended in a story referencing Westworld. 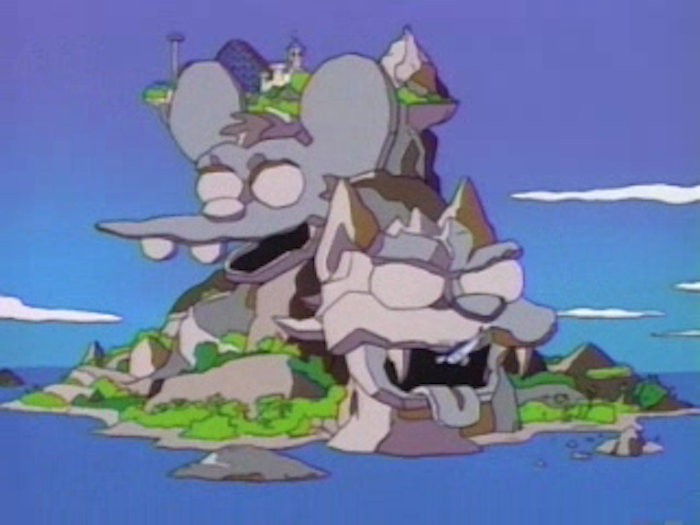 The original Skull Island? 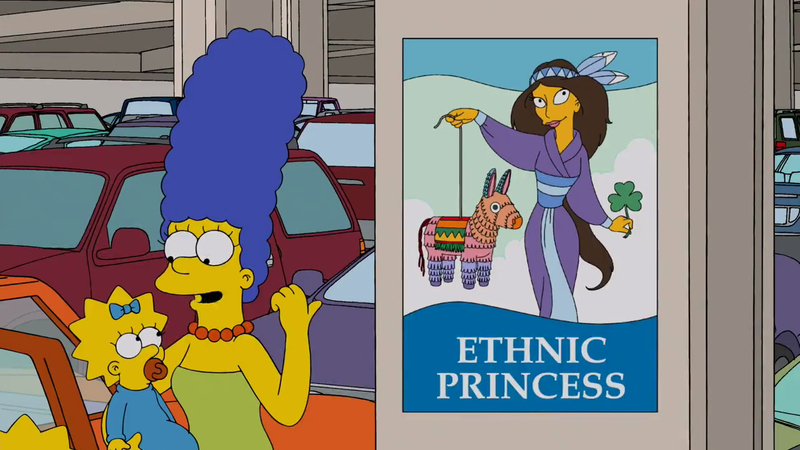 I guess South Park was right, The Simpsons did it first. Everything. 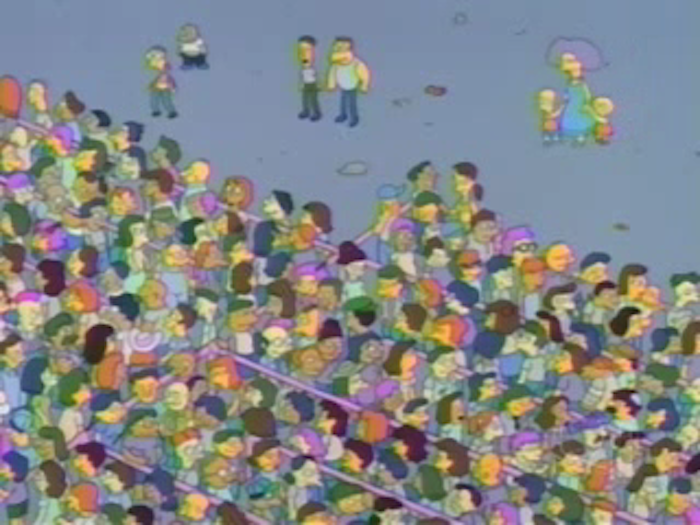 Note the lines of people lining up to buy tickets. At the ticket counter, Homer is talked into Itchy & Scratchy money, which was referencing Disney Dollars. 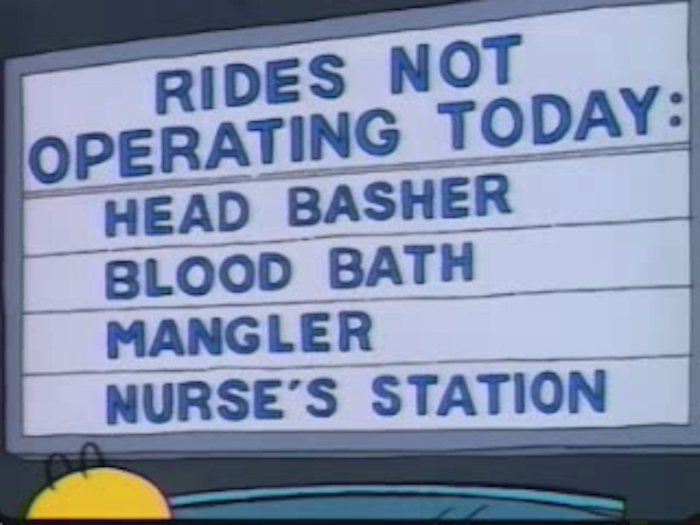 Anyone who has been to a theme park has seen the signs alerting people to what rides aren’t in operation for the day. This episode takes some deep dives. 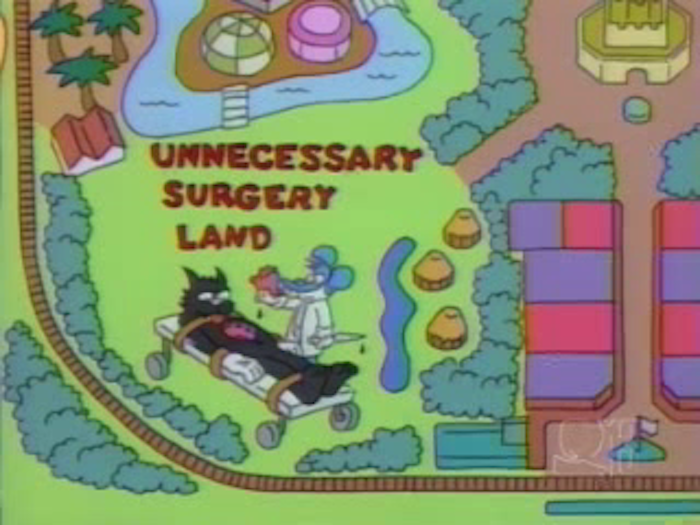 This is just part of the Itchy & Scratchy Land park map, which was laid out just like you would see at the Magic Kingdom. 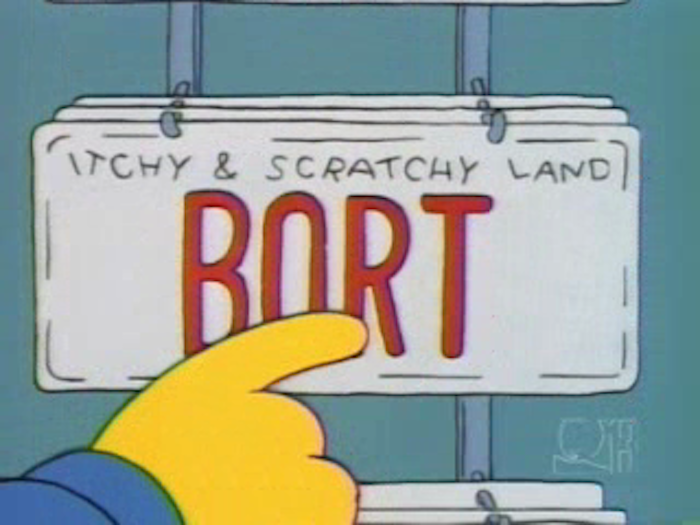 The “Bort” license plate. 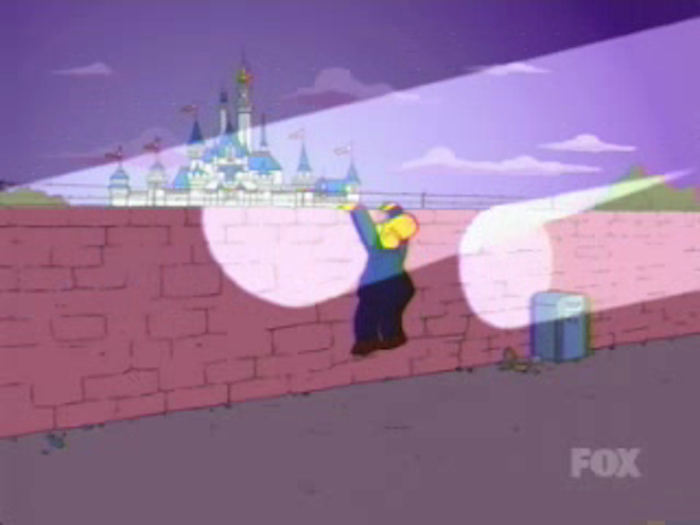 One of the top five all time great moments in Simpsons history? 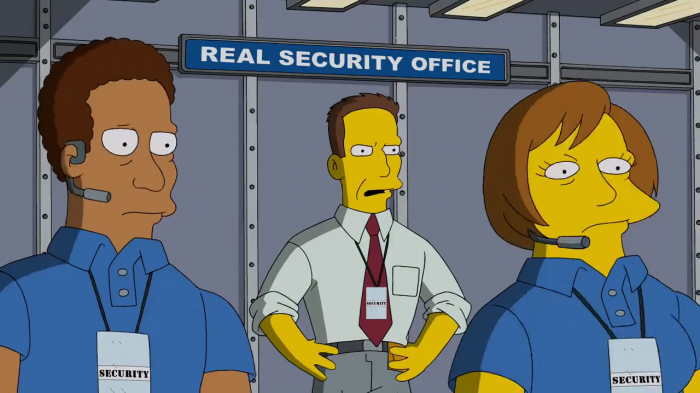 We covered the Bort merchandise available at the real Universal parks in this SATURDAY SIX. 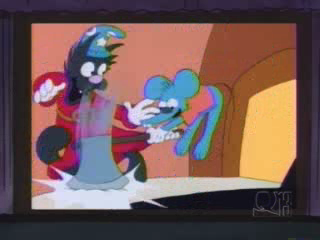 Scratchtasia, a film referencing Disney’s Fantasia. 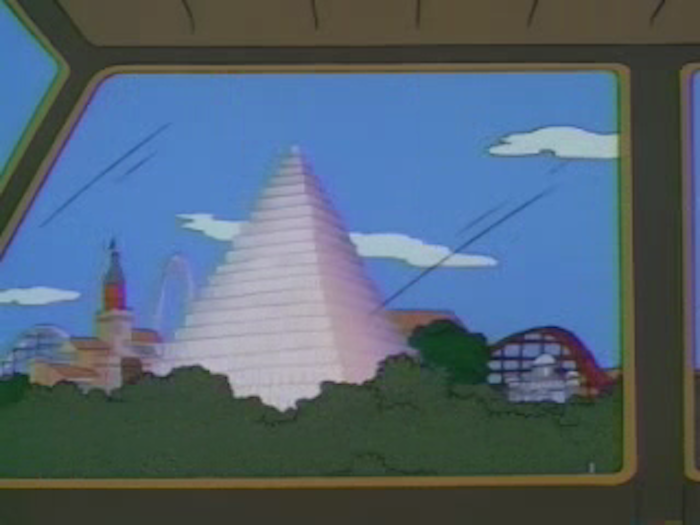 This was shown in the Roger Myers Story attraction (think One Man’s Dream). 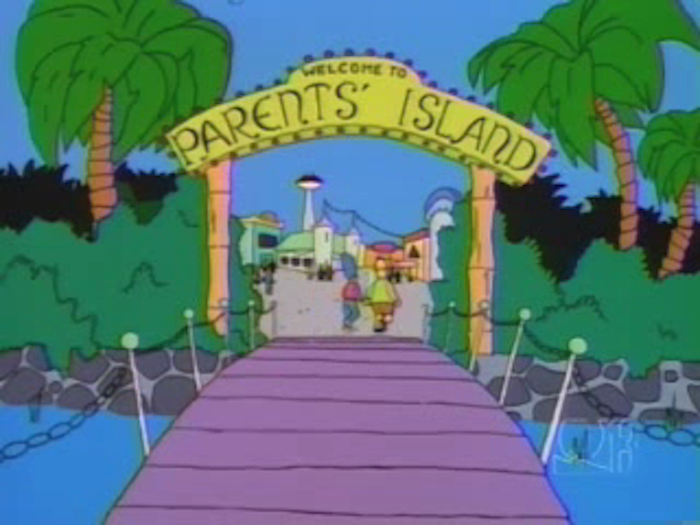 Parent’s Island, eerily similar to the old Pleasure Island at Downtown Disney. 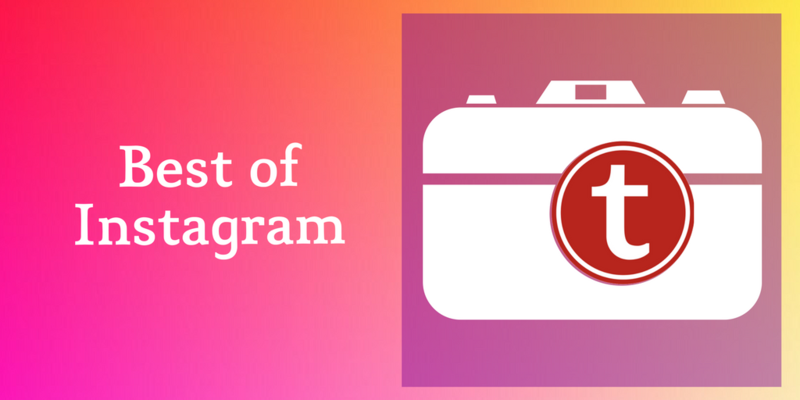 Also on Parent’s Island was “T.G.I. 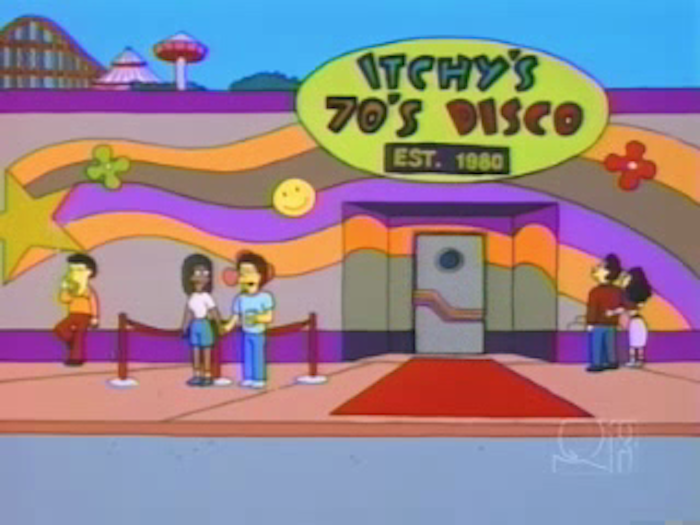 McScratchy’s Goodtime Fooddrinkery.” Here is where they celebrated New Year’s Eve every single day. 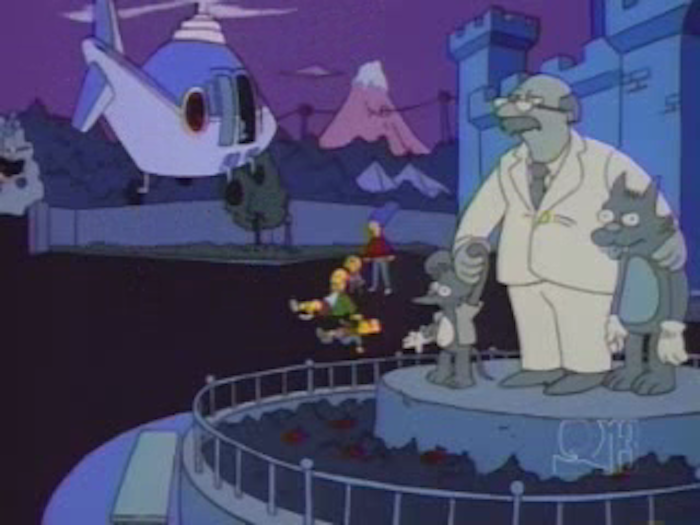 Partners statue reference featuring Roger Meyers and Itchy & Scratchy. 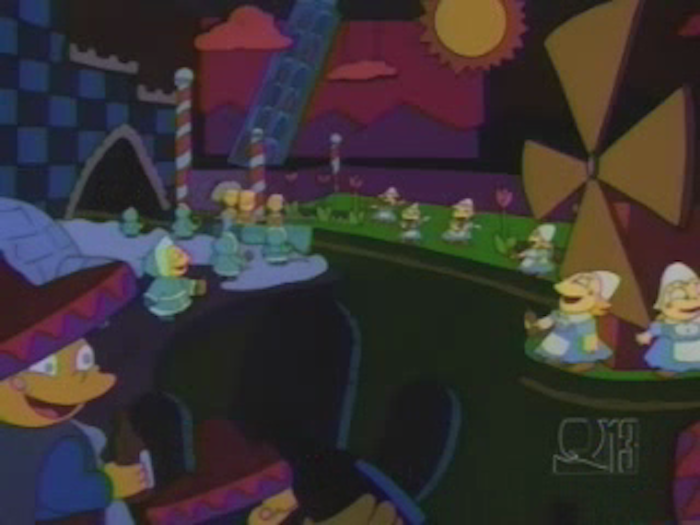 The episode featured the audio animatronics of the park going haywire and trying to kill the guests. Maybe it’s a good thing our Yeti can’t move after all. 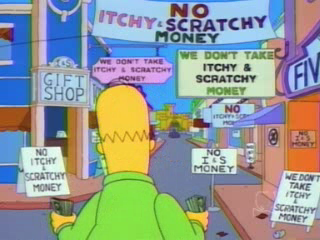 Anyway, after the robots are defeated (by the flashes of disposable cameras, talk about a moment in time,) Professor Frink says, “If this is happening here, I hate to think what is happening in Euro Itchy & Scratchyland.” We then cut to a deserted Euro Itchy & Scratchy Land, with a ticket salesman yelling out for people to come. 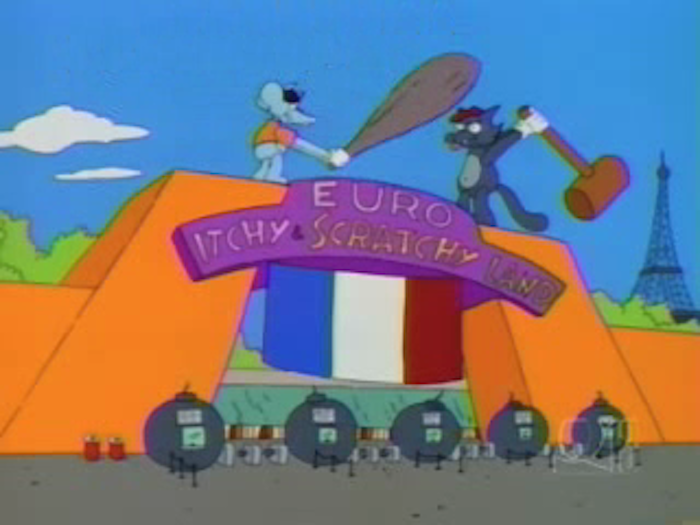 Euro Itchy & Scatchyland. No one in line. “Hello! 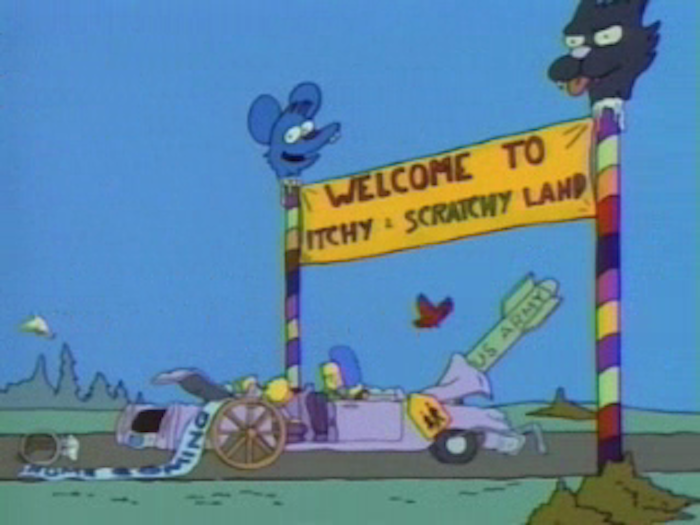 Itchy & Scratchyland open for business! 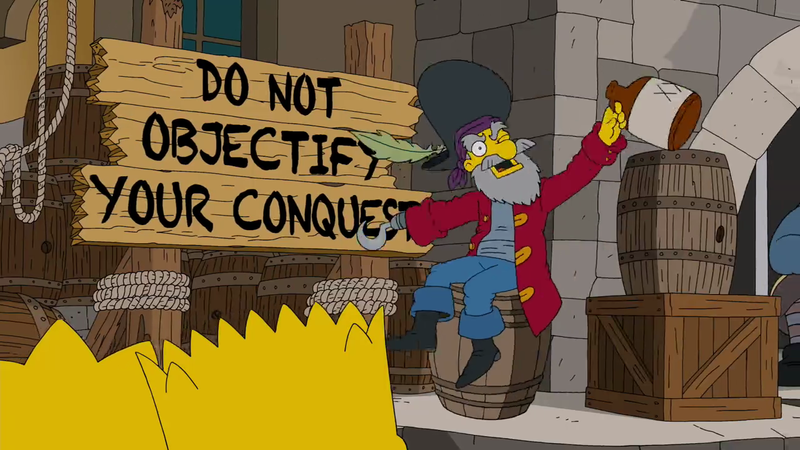 Who are you to resist it, huh?” – Sounds better when you read it in a horrible French accent. For Disneyland fans, Season 26’s episode on the Simpsons going to Dizzneeland is worth going out of your way to see. 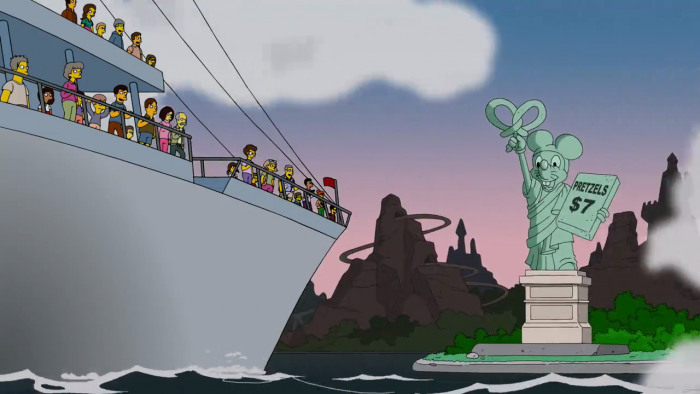 Each episode is broken up into three acts, and only the first act relates to the theme parks, but boy do they pack a lot in. We start off with the family parking in a parking structure (which we don’t have at any of the WDW parks) and Homer tells his family, “Don’t worry, this time I’m going to write down where I parked!” He wrote down “parking lot,” so you know right from the start we are in a for a fun ride. We then get to see the family experience the frustration of slow moving rides for young kids, Star Wars being integrated into the Disney parks, and long lines for – well – everything. The Dizzneeland adventure is filled with jokes for theme park fans, by theme park fans, and that’s what makes The Simpsons so special. Long escalators will be very familiar to anyone who has gone to Universal Studios Hollywood. The family then boards a tram. 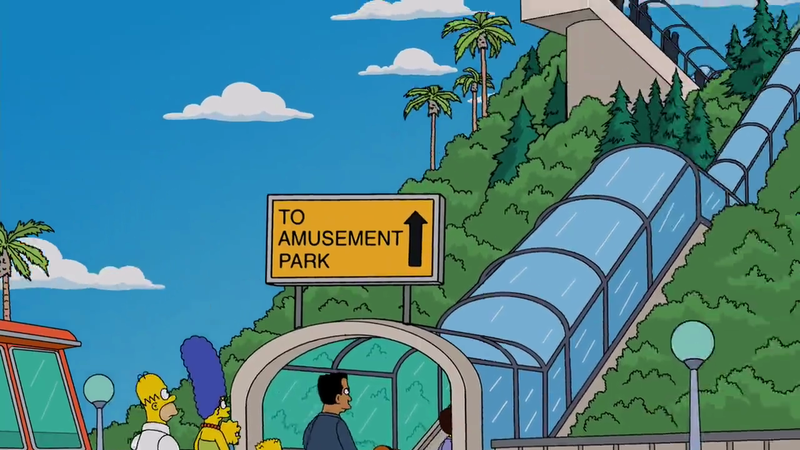 Which leads to an escalator going up. This is referencing a very famous photo from the Vietnam War. 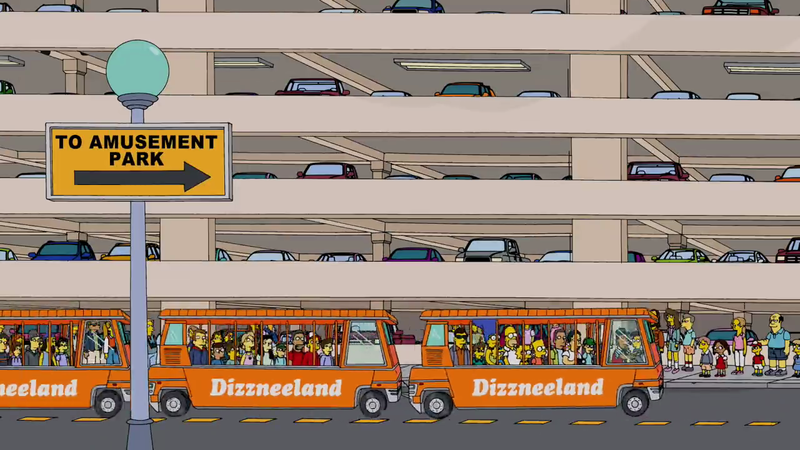 Now people know what it is like for us WDW annual passholders having to park at the TTC to go to the Magic Kingdom! If you can’t laugh at that, you may be dead. 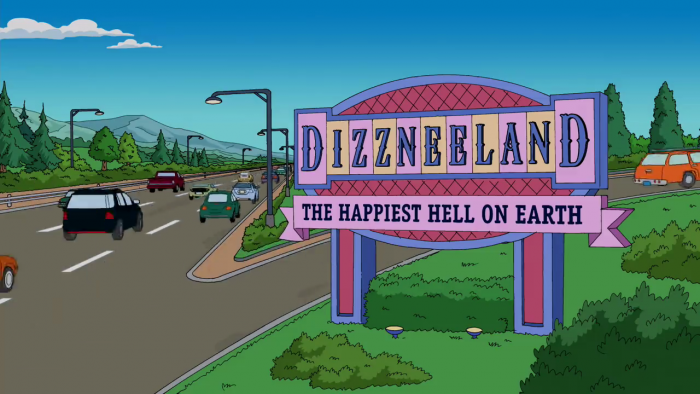 The Dizzneeland entrance, with what looks like versions of Big Thunder Mountain, the Sky Way, and the Matterhorn. In a fun moment, after showing the entrance the “camera” moved back to reveal the large security entrance. Perfect. Absolutely perfect. Homer gets patted down by a Chip & Dale-like character. 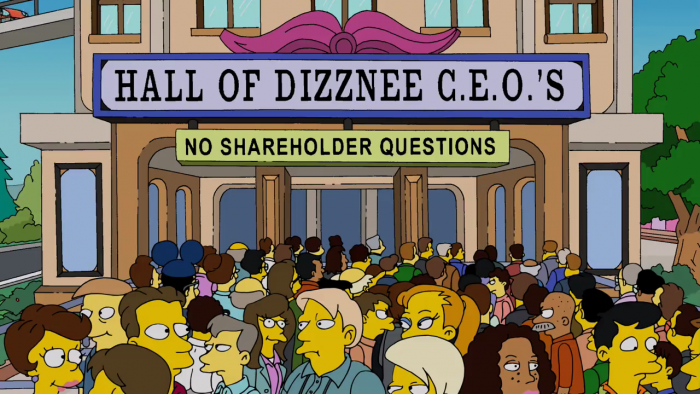 No outside pacifiers allowed in Dizzneeland. 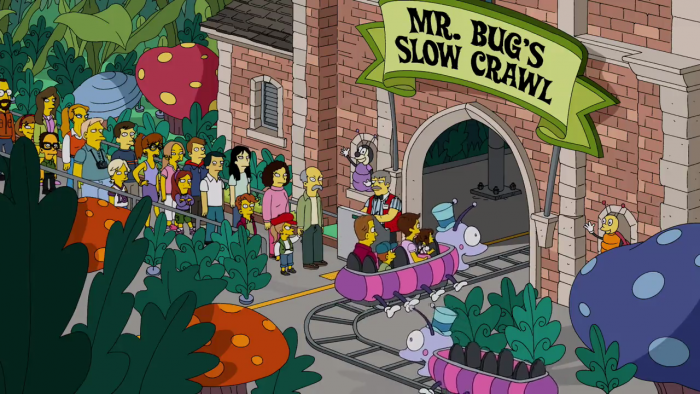 This riff on Heimlich’s Chew Chew Train might have been a “shots fired” moment at Mark Diba and TouringPlans’ own Guy Selga. 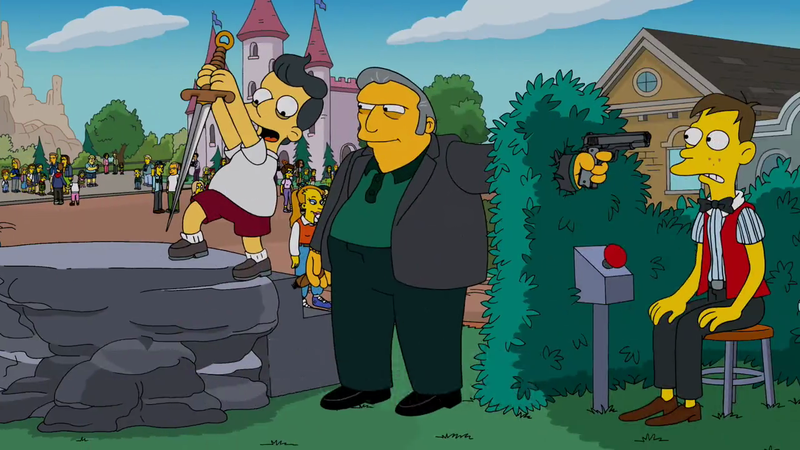 The kid pulls up the sword as it is revealed Fat Tony pointed a gun at the Cast Member. Reference to Mr. Toad’s Wild Ride. “No means no, we knooow now. No means no.” – Pirate song. 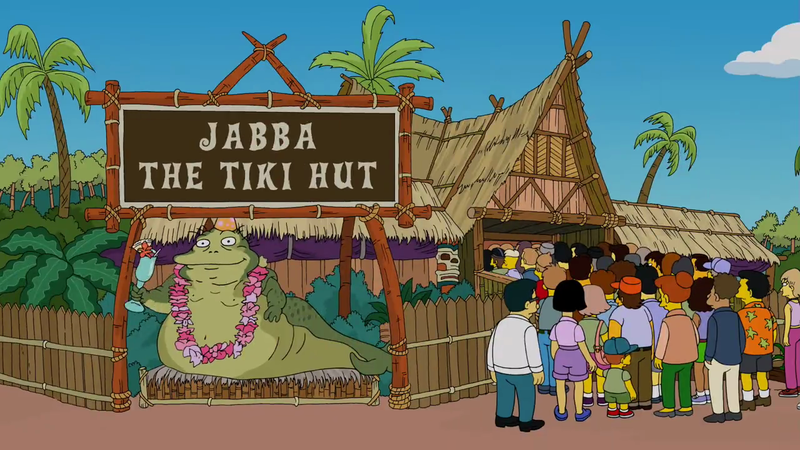 There are not enough stars in the galaxy to describe how great this joke is. That’s what we in the biz call a sick burn. 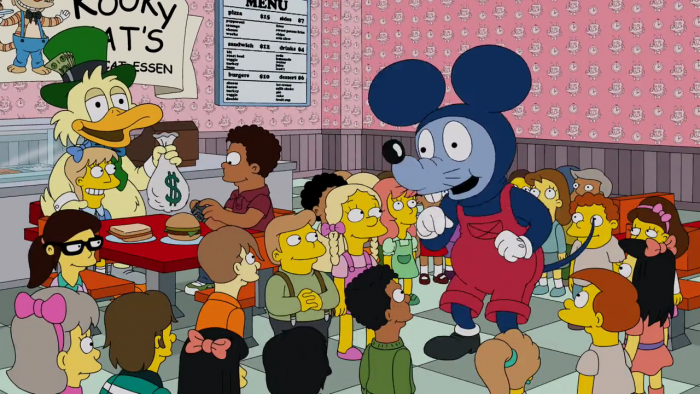 Who among us hasn’t had to the same at any Disney counter service restaurant. 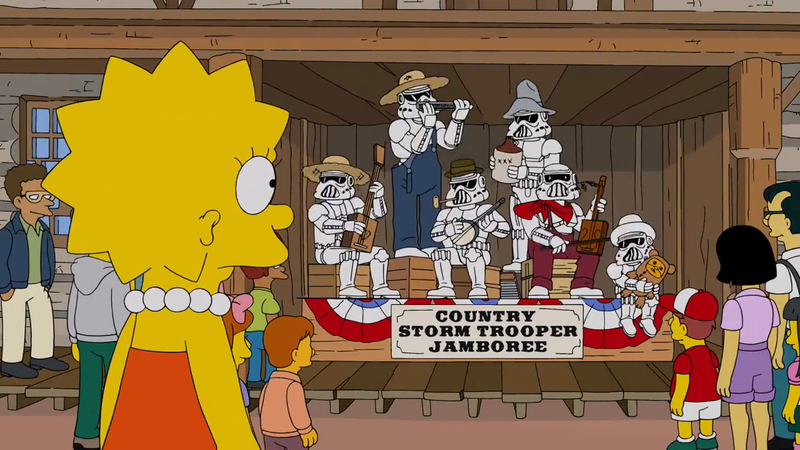 Note the Song of the South reference. The rabbit in that picture is from Matt Groening’s comic strip Life In Hell, which is what eventually lead to The Simpsons being created. 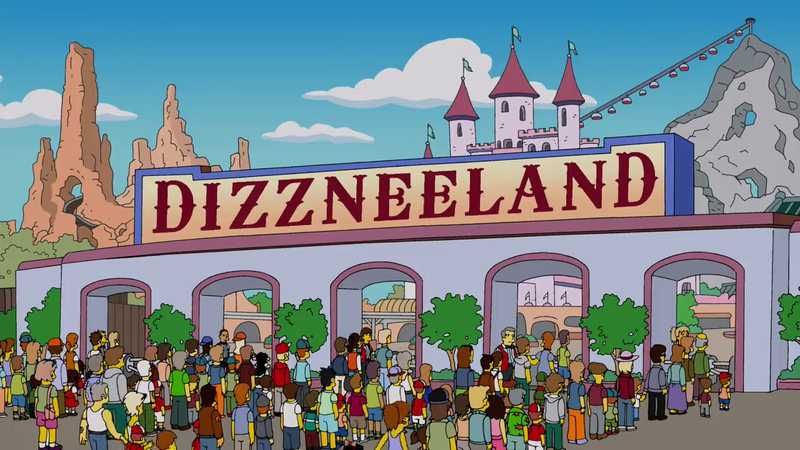 In the background we can see Dizzneeland’s Astro Orbiter. Hold on, you’re STILL not following me on Twitter? What’s up with that?! 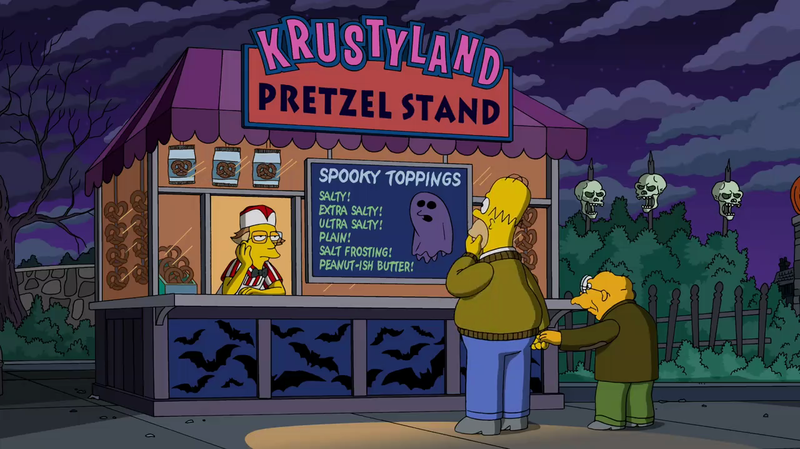 Our Six Favorite Jokes in Universal’s SPRINGFIELD U.S.A.
Special Thanks to crack staff photographer Brandon Glover, master photo manipulater Matt Cleary, the leading generator of 404 error messages on the entire internet – Tim Grassey of WDWThemeParks.com, and blogger to the stars Megan Stump for their invaluable assistance with this article. Be sure to also check out Brandon on The Park Blogger podcast with co-host Aengus Mackenzie along with Meg’s Yeti To Be Named Disney Podcast. 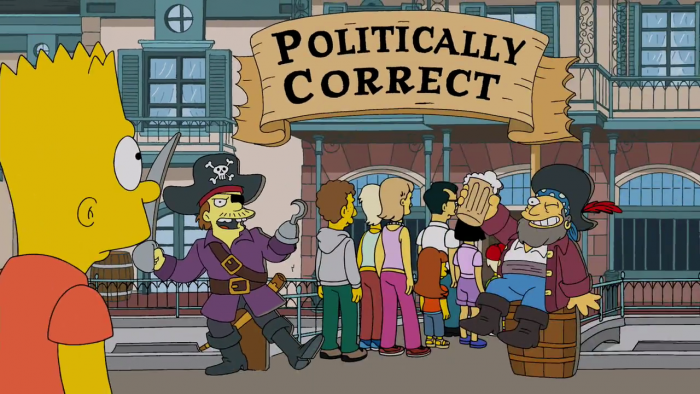 The SATURDAY SIX isn’t the blog the theme park community deserves, but it’s the one it needs. Wow, what a great article by Mr. Burgan. A true labor of love. Besides all the free advertising The Simpsons have provided Disney over the years, the icing on the money cake is the anchoring of our egregiously high prices and long wait times. 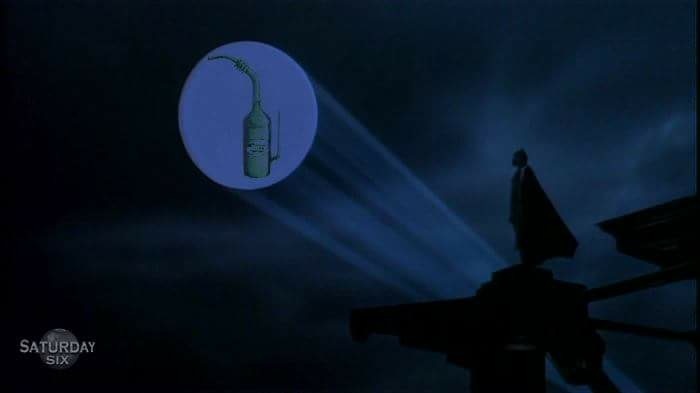 You know what you’re in for, people! Great article! I’ve never seen these episodes but reading about them makes me want to see them. A really fun read! I’m looking forward to a special dining package for Disney’s Main Street Dumpster Fire Parade. 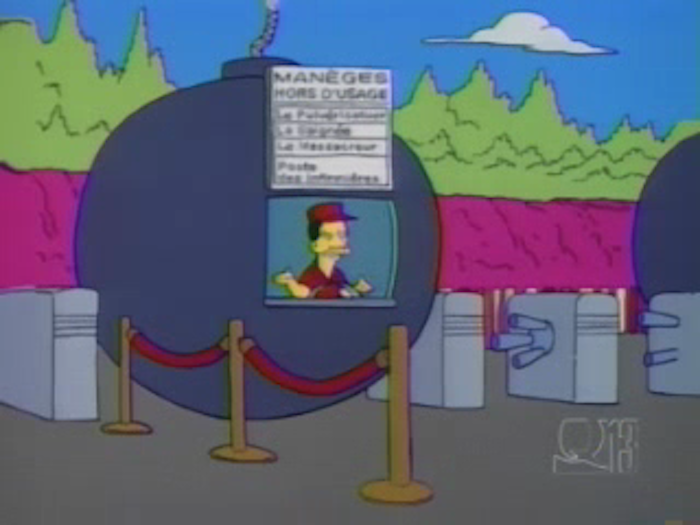 I think it will include a Nothingburger, and a Bob Iger souvenir cup. Loved it! 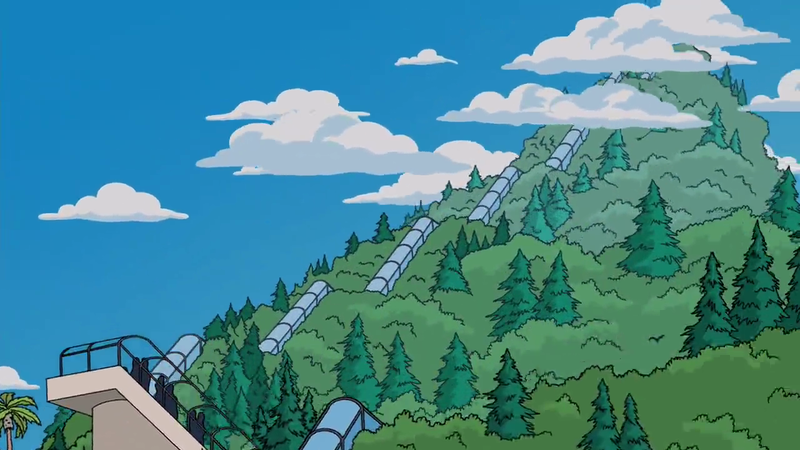 I loved every one of these episodes. 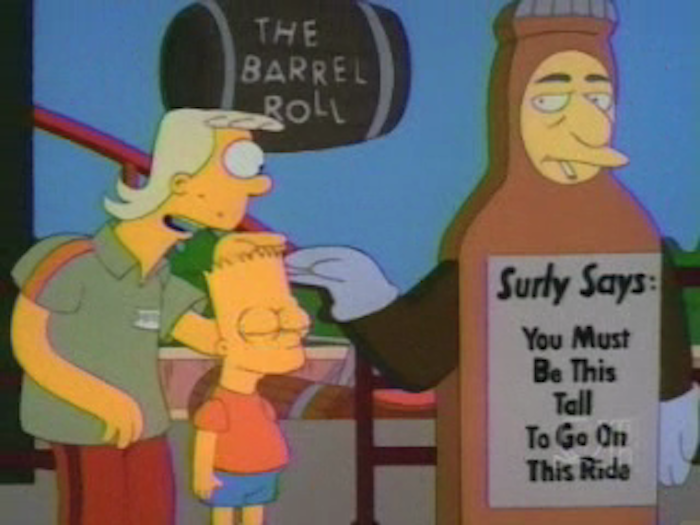 I may have been using the Bort joke at every spinner of personalized merchandise for decades. Funny every time! We are heading to Universal for the first time next year and himself, being English and thus a foreigner, has not ever seen one single Simpson’s episode – thanks for the primer! Thank you! Super great article! 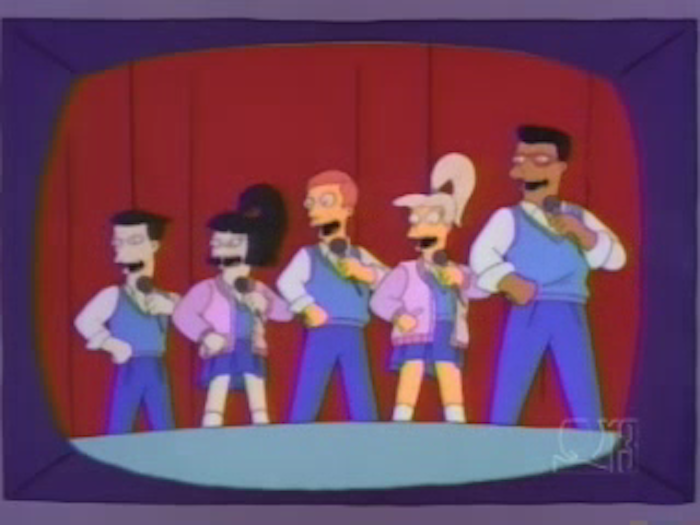 Listen, The Bort jokes were funny back in the 90s…..oh who am I kidding they are still funny. 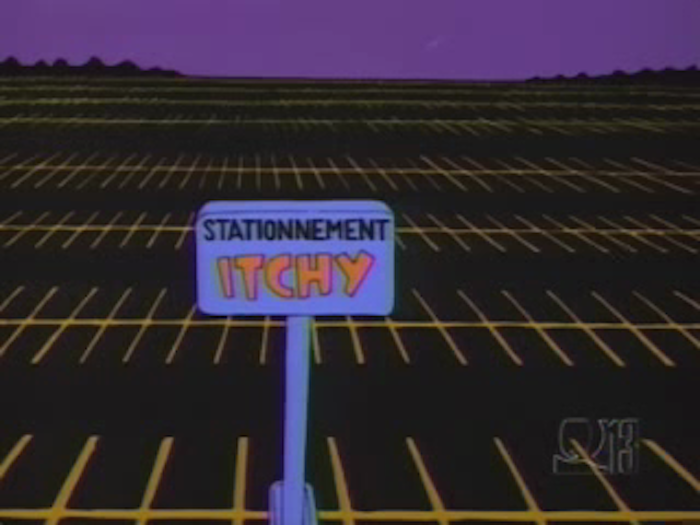 Lord help me if they are out of Bort License plates. 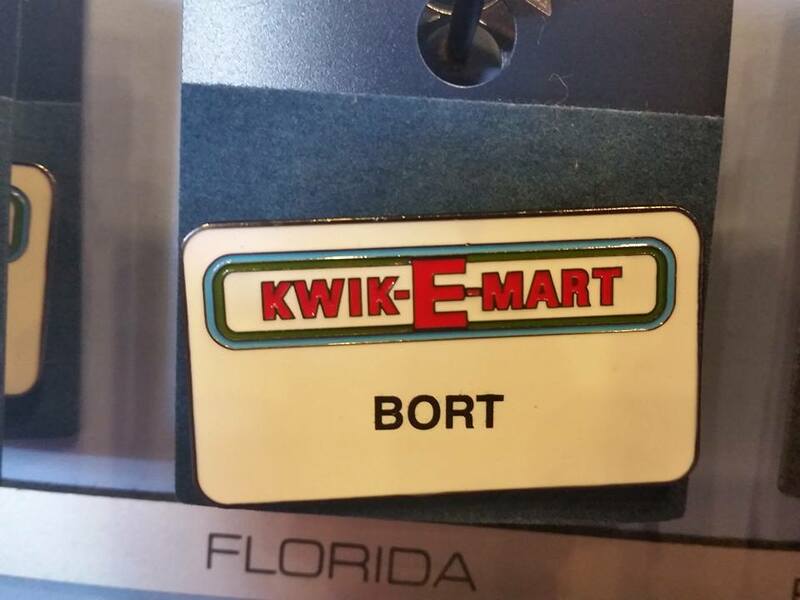 And yes, Bort is my real last name.